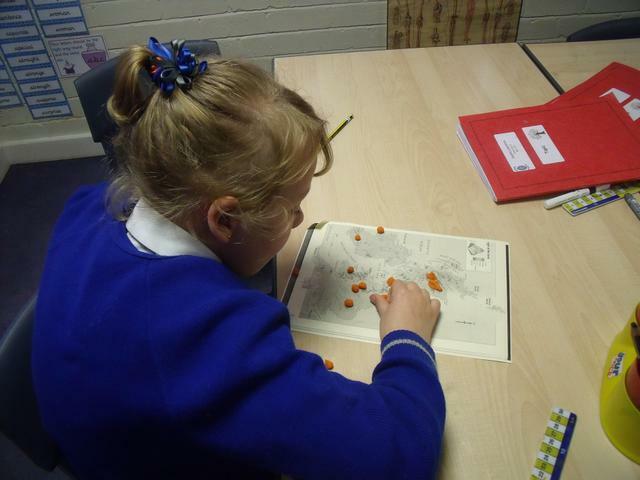 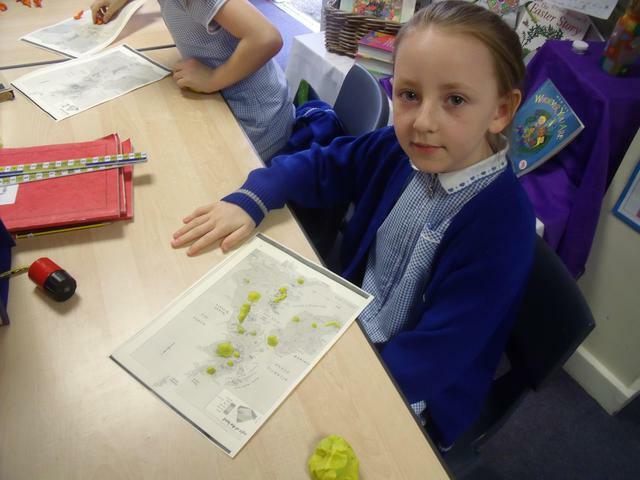 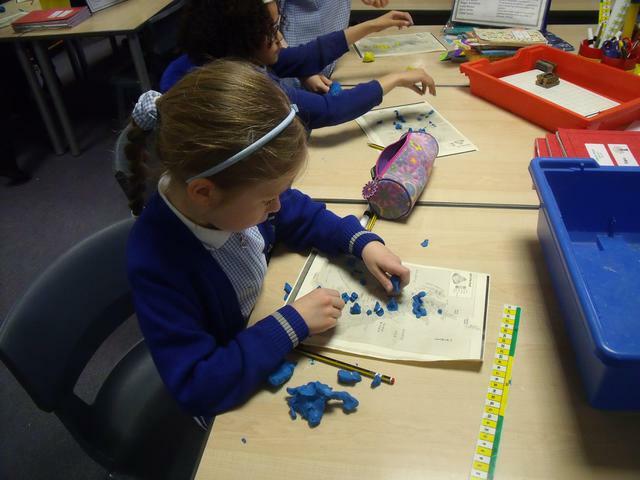 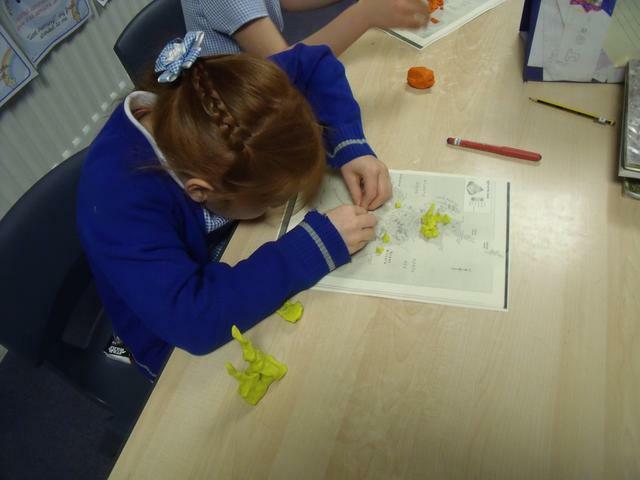 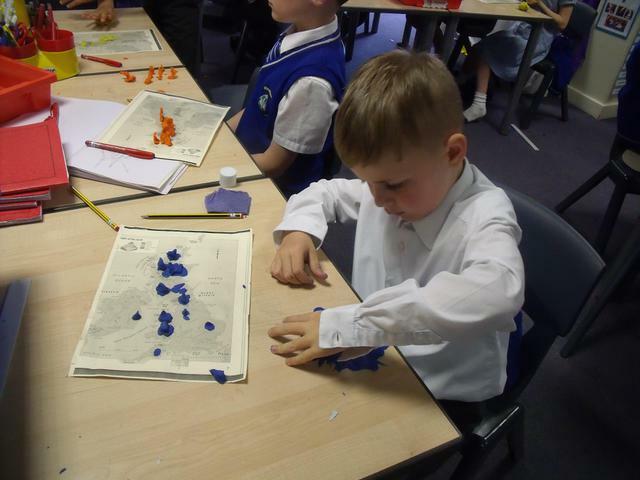 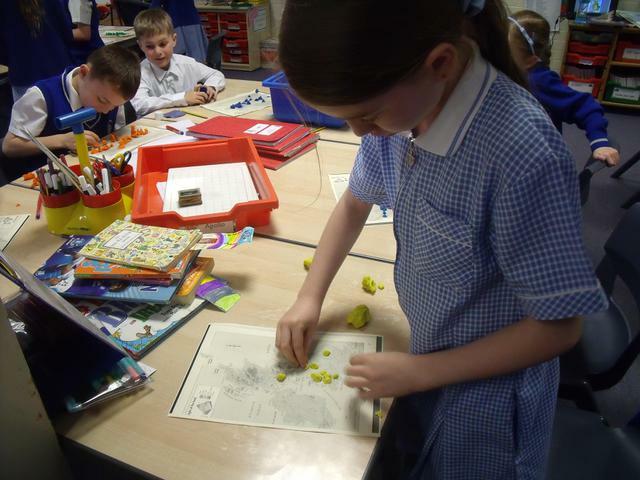 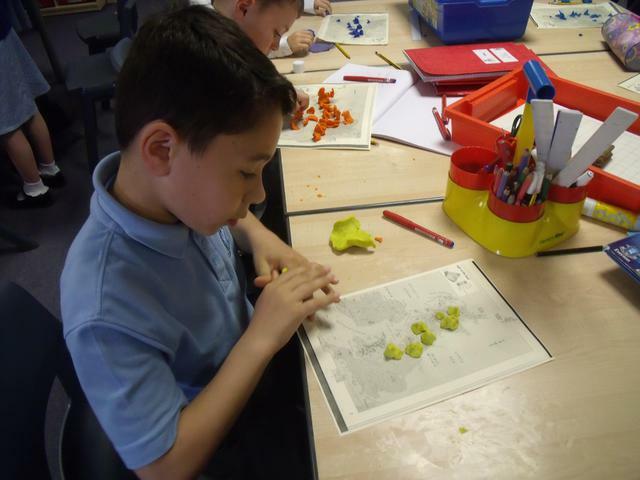 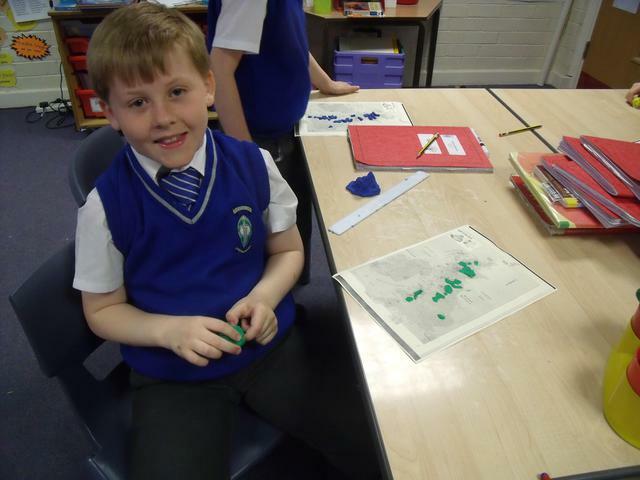 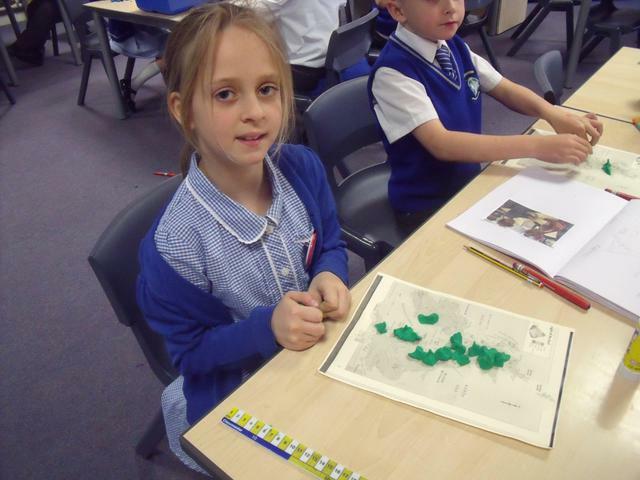 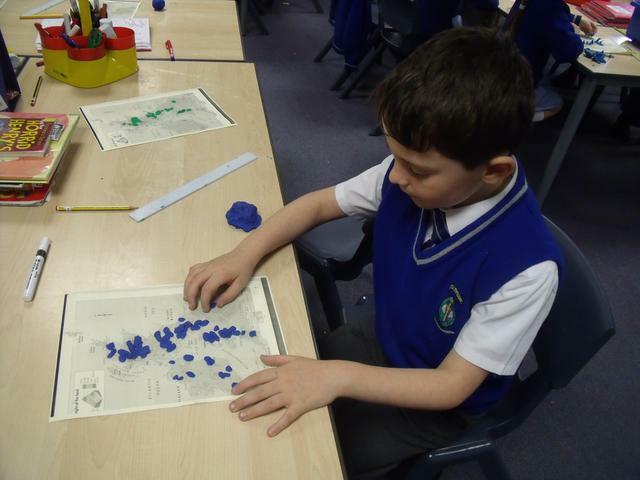 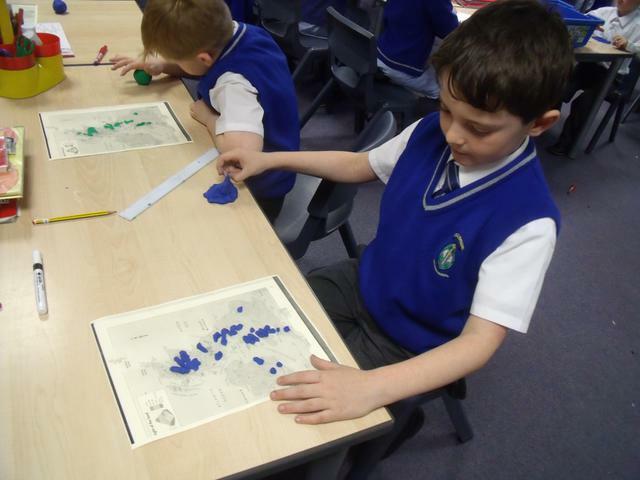 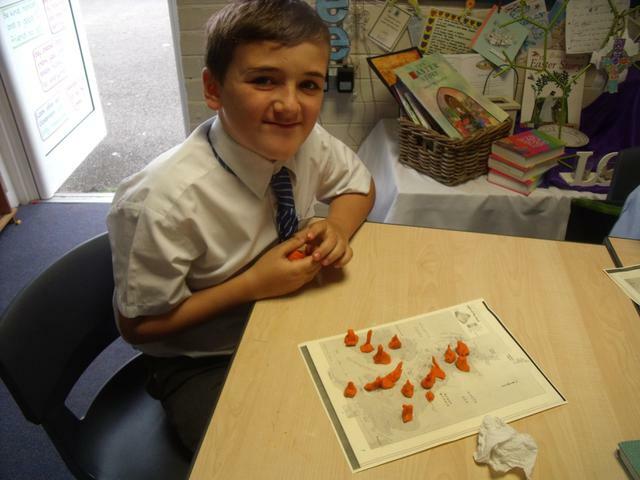 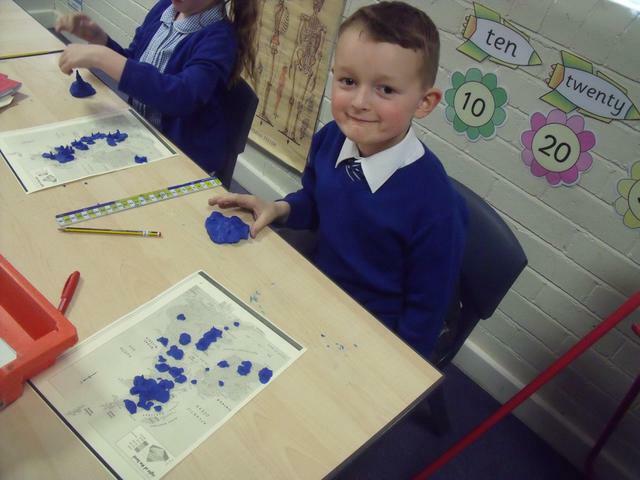 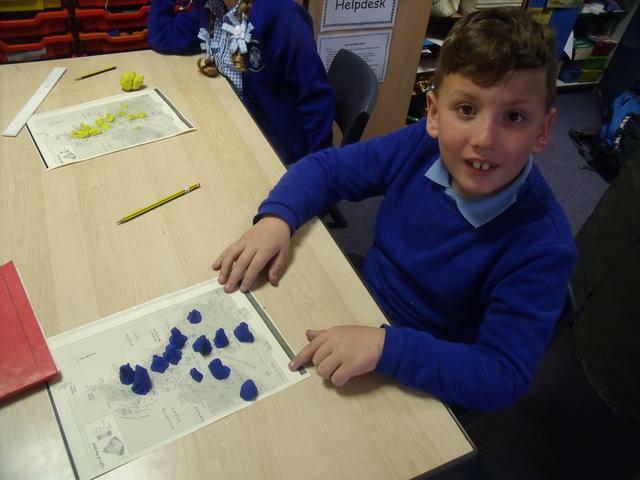 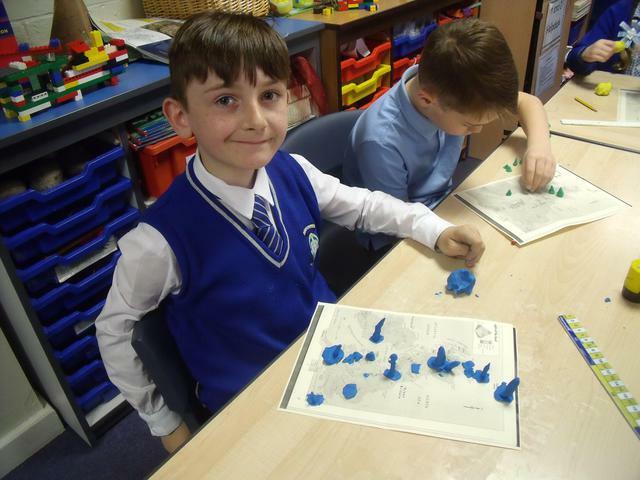 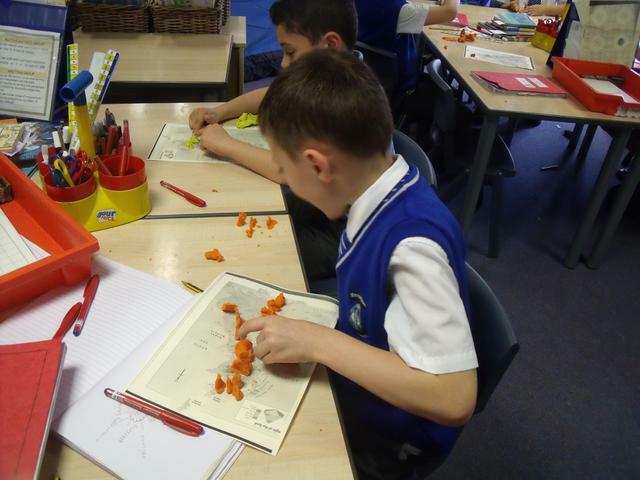 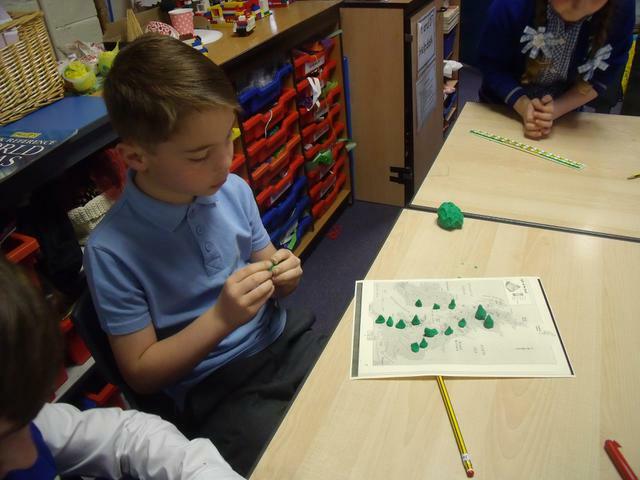 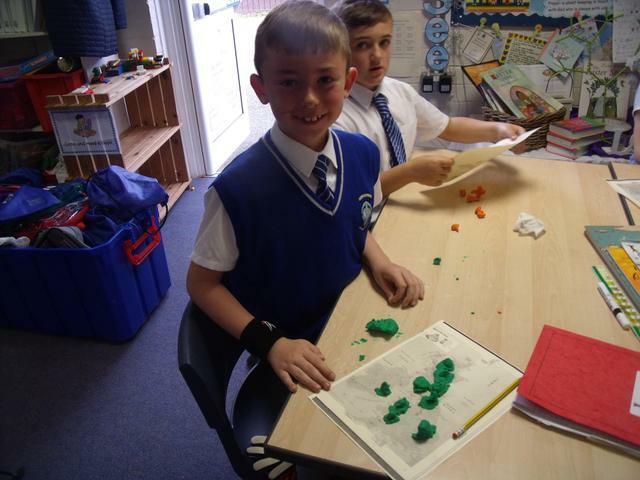 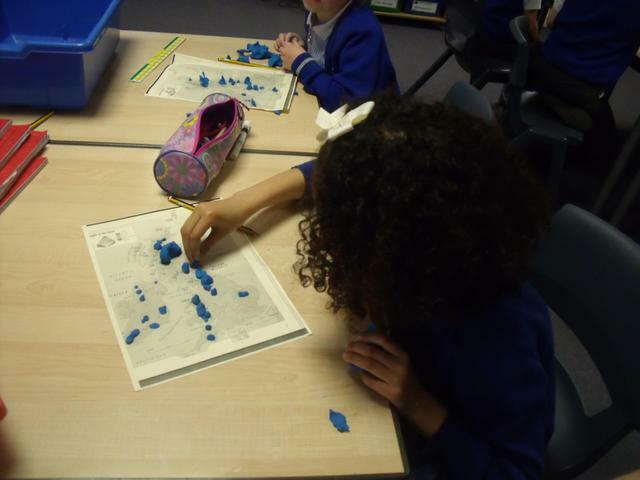 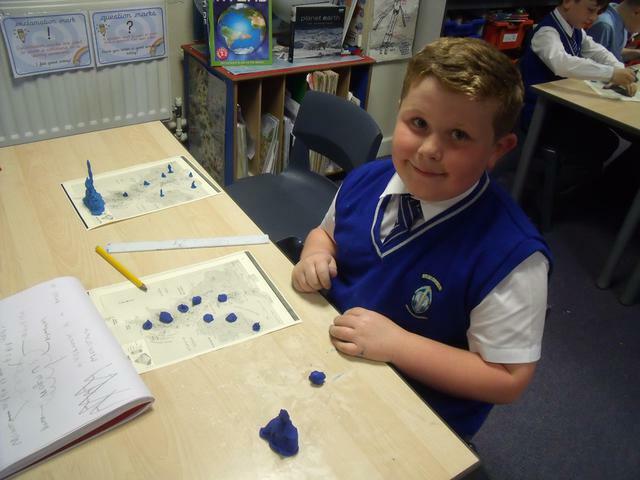 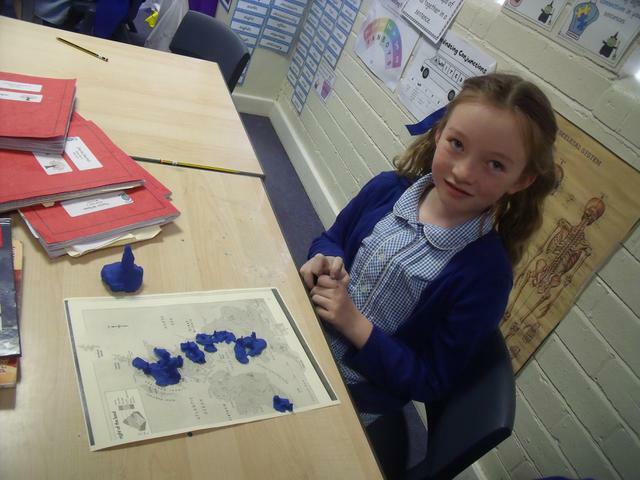 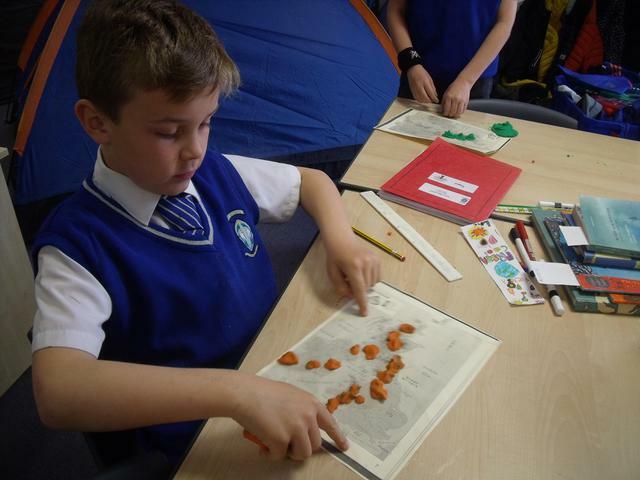 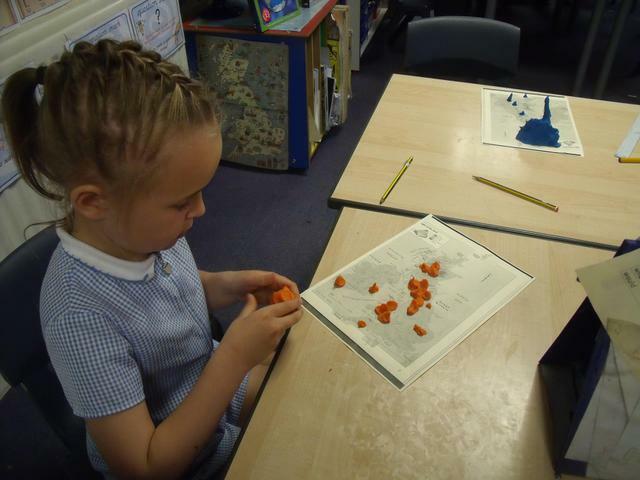 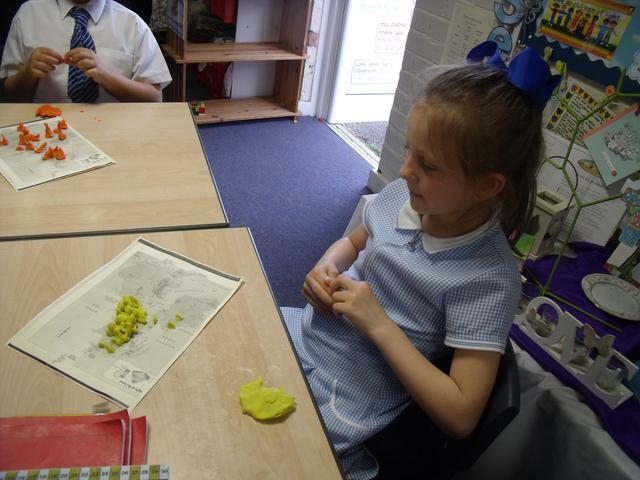 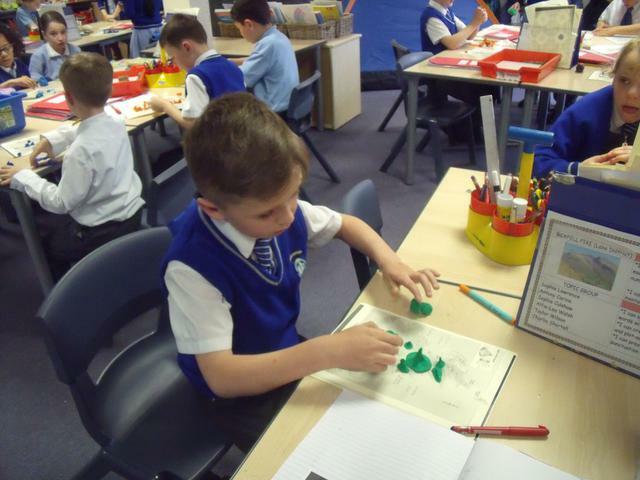 The children had a great time making mountains using plasticene and placing them on a map of the British Isles. 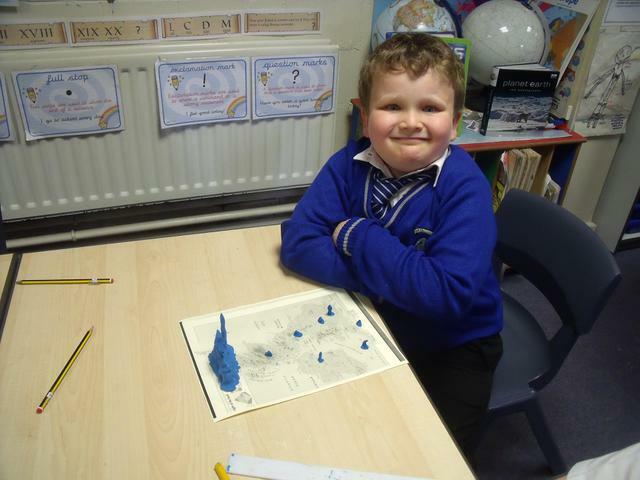 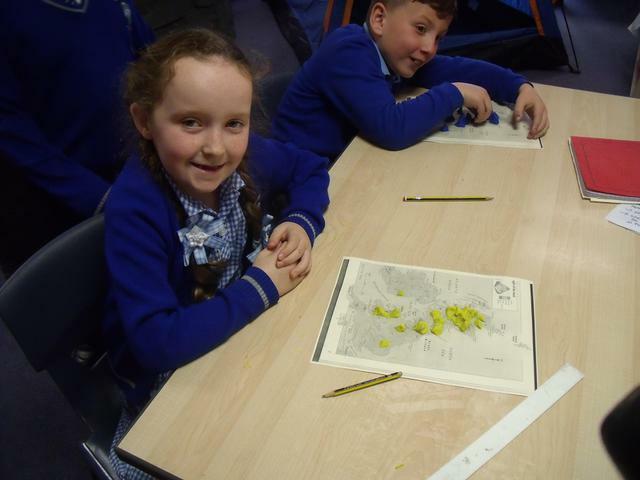 all children were able to locate the tallest mountains in the British Isles too. 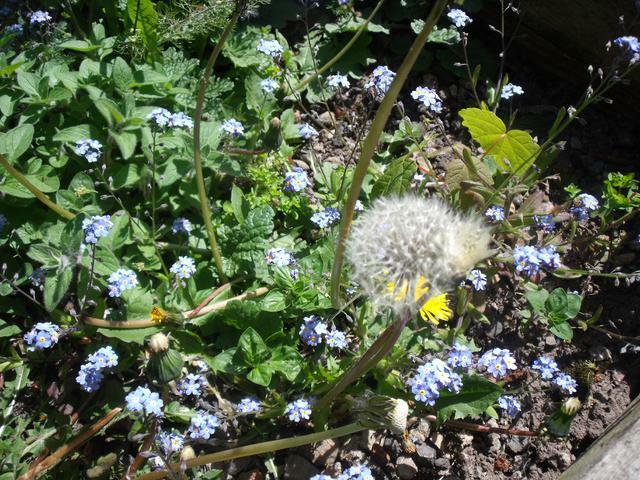 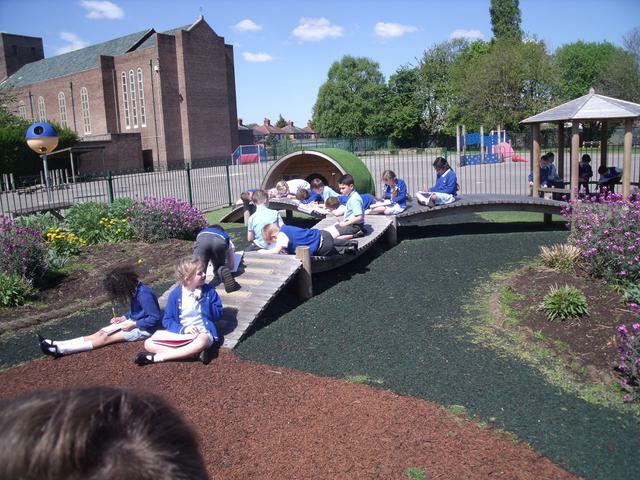 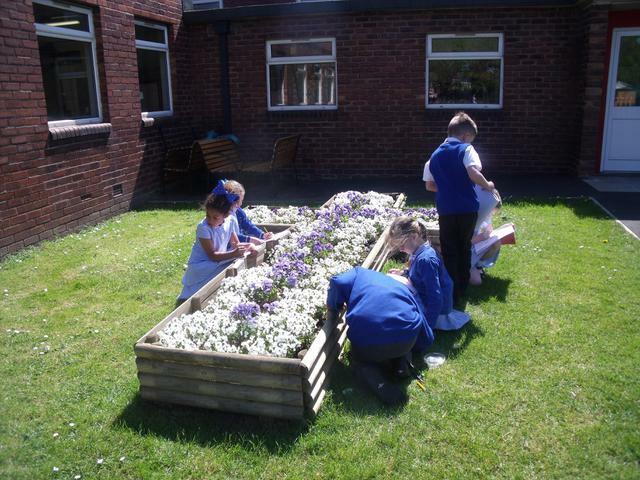 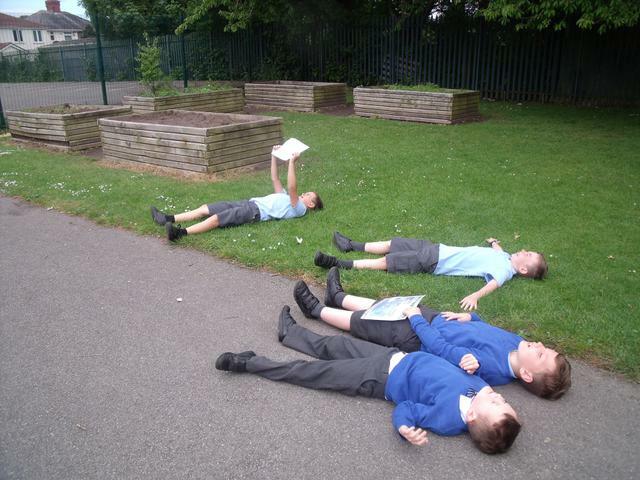 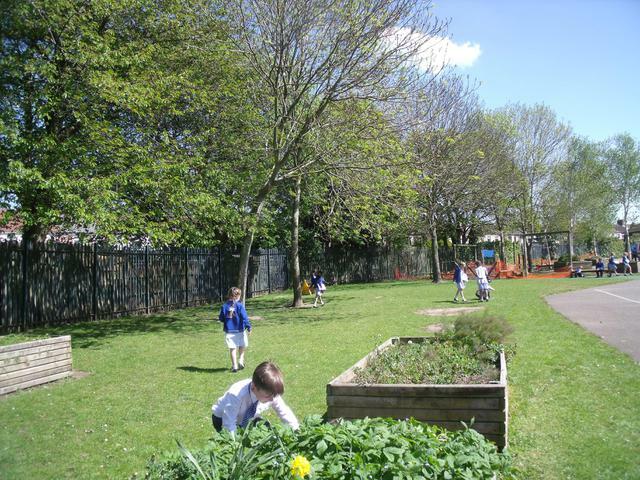 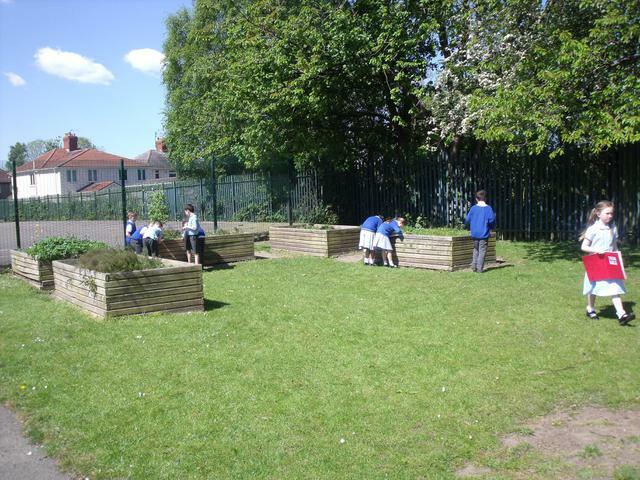 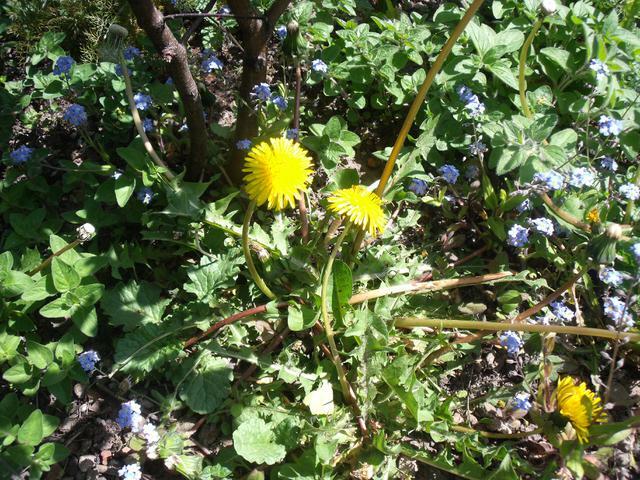 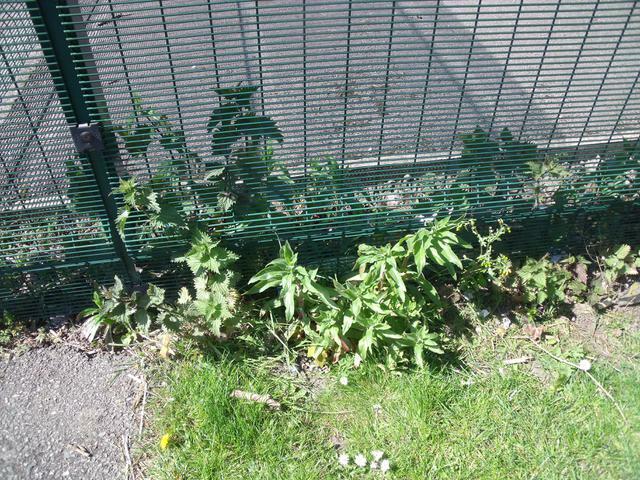 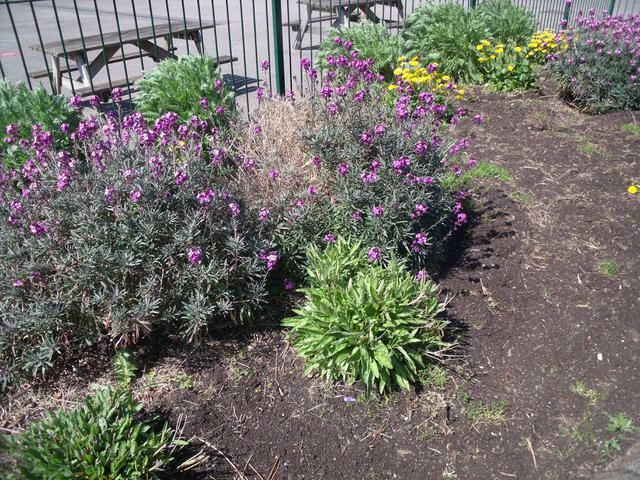 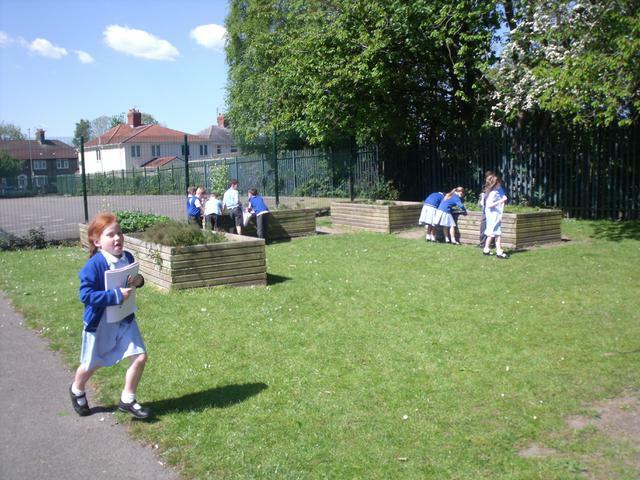 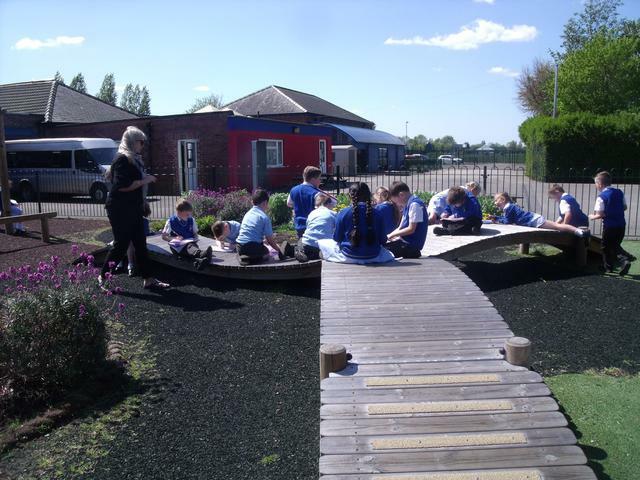 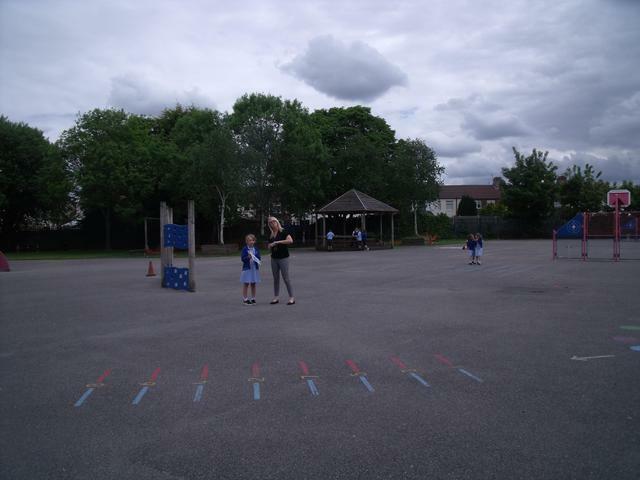 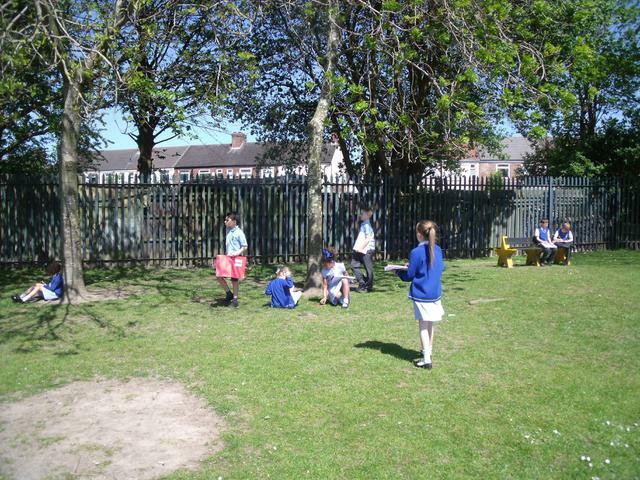 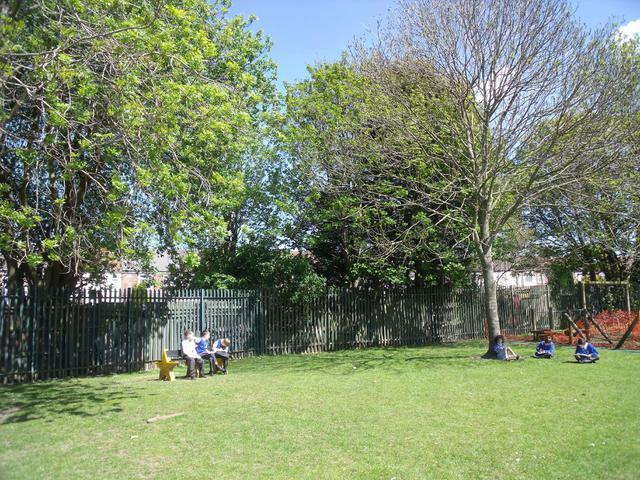 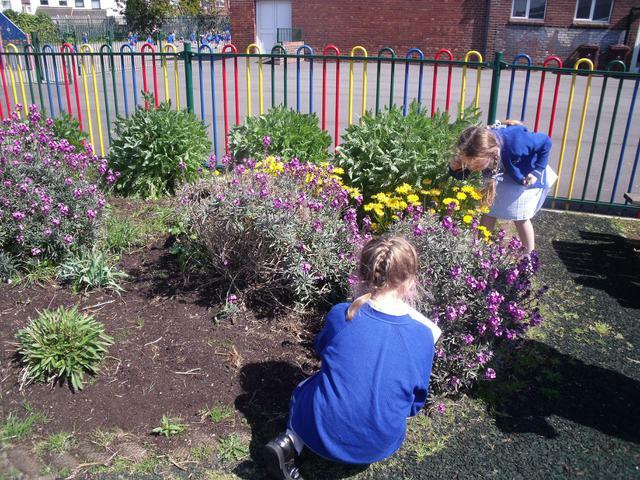 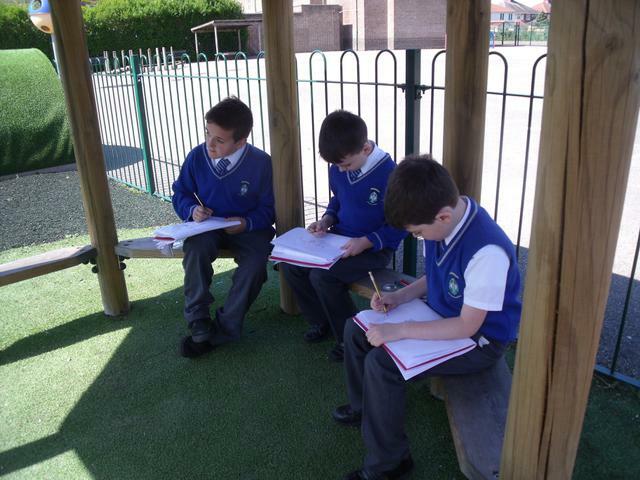 The children enjoyed observing and sketching plants they found in the school playground. 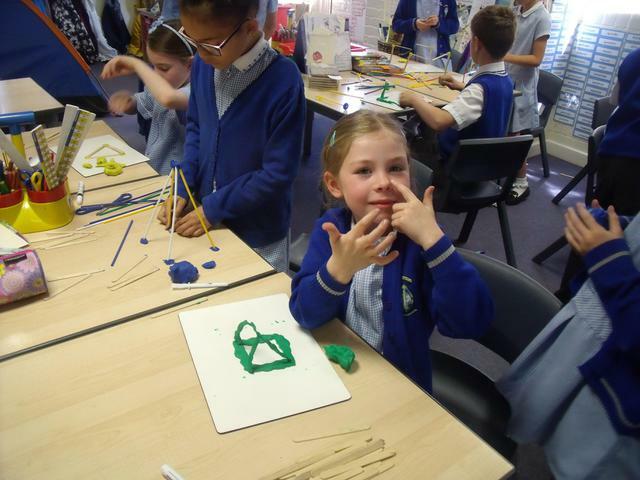 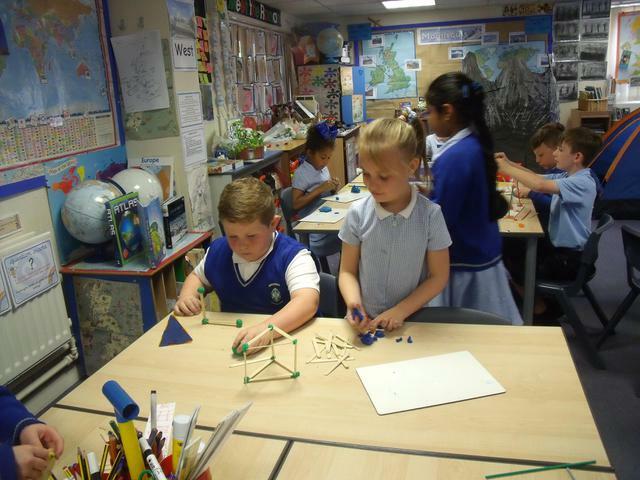 The children were given straws, lolly sticks plasticene and polydron. 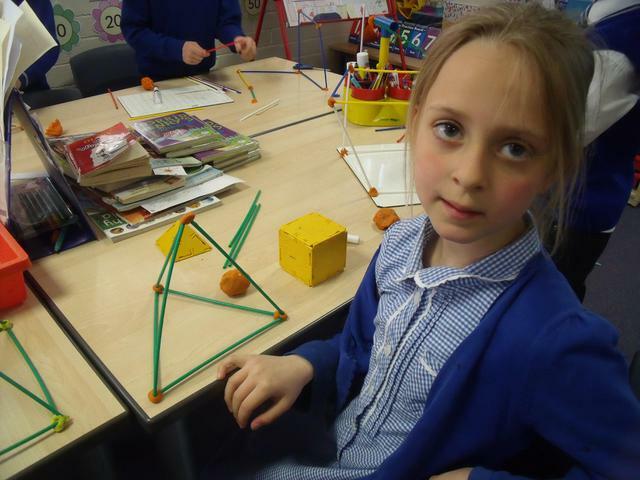 They had to make a 3D shape. 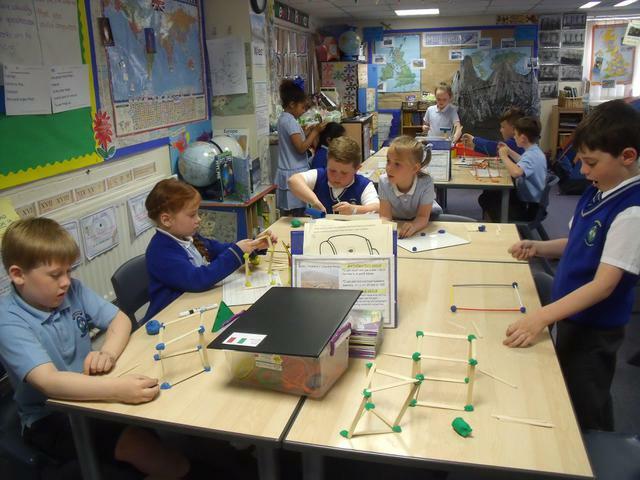 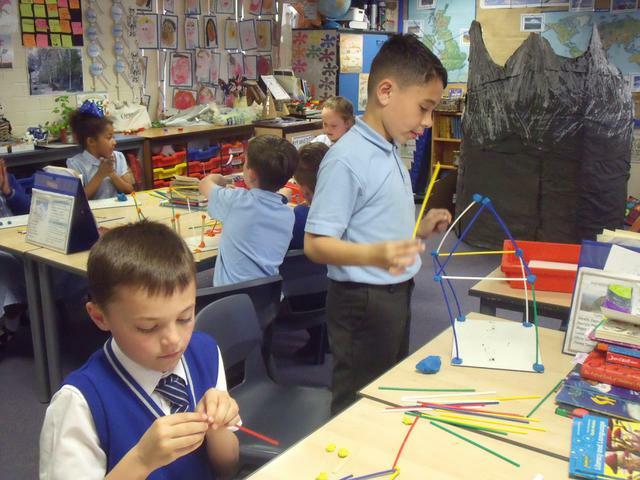 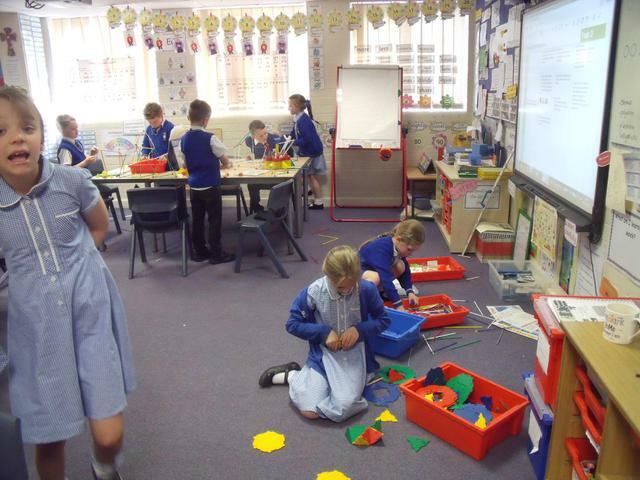 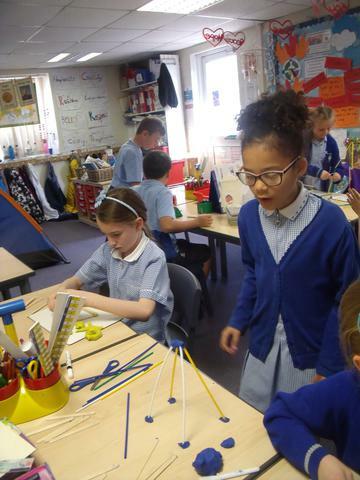 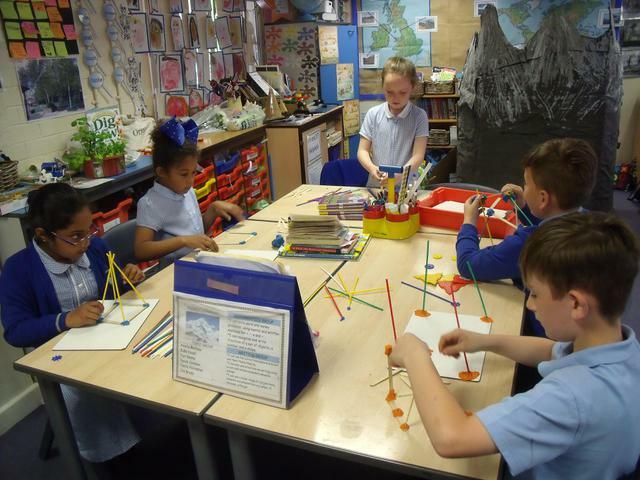 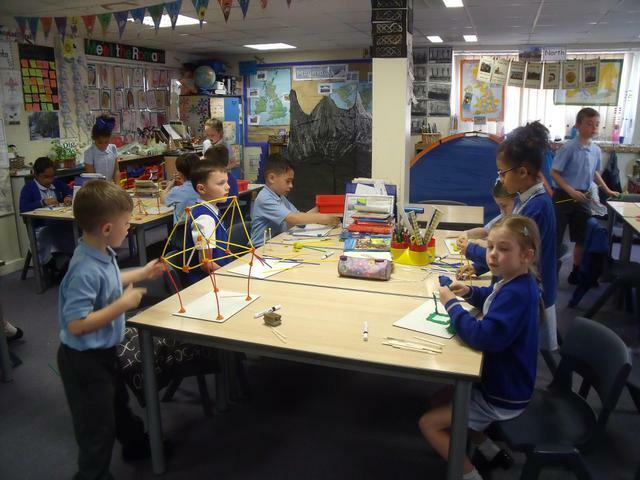 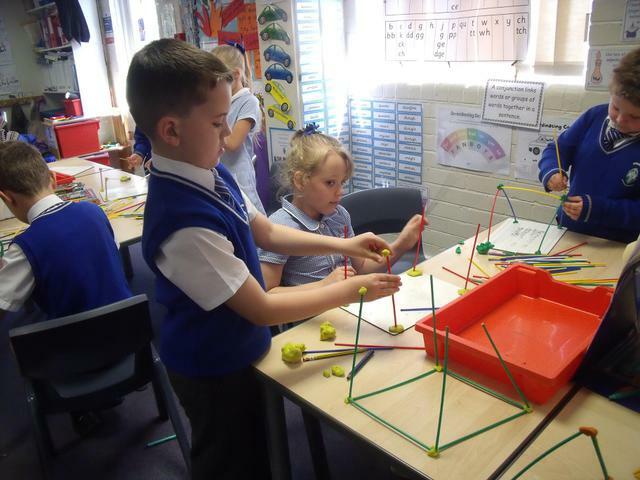 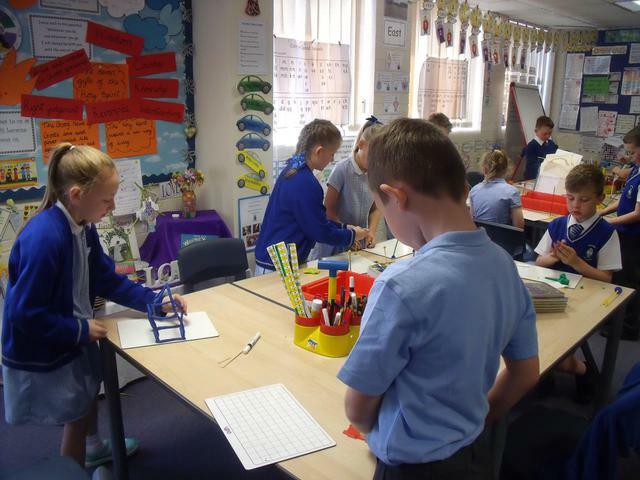 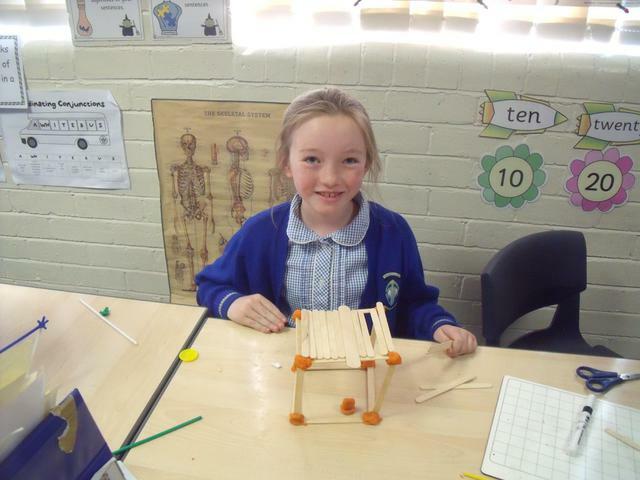 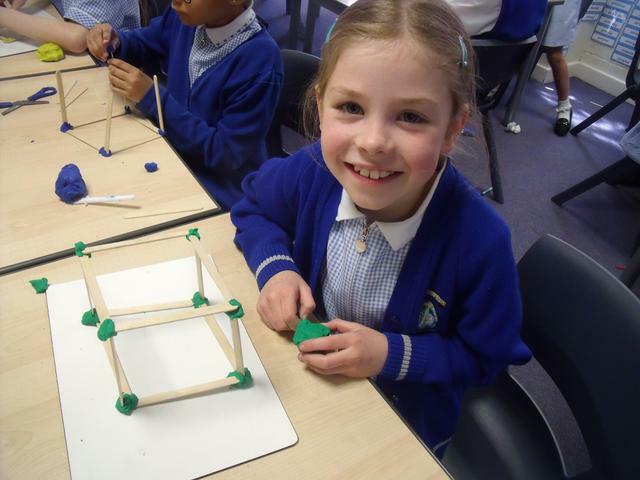 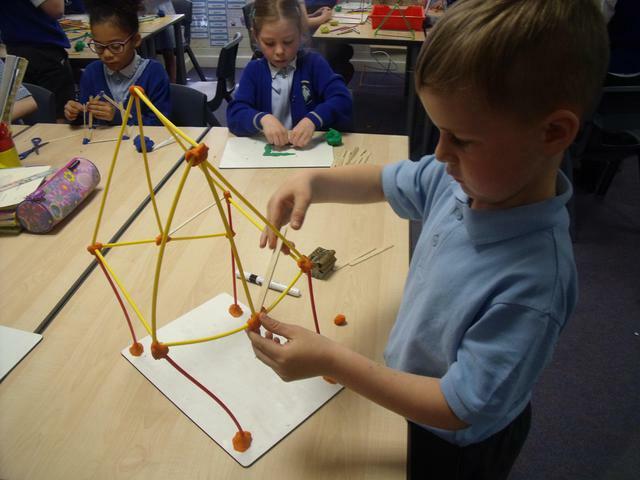 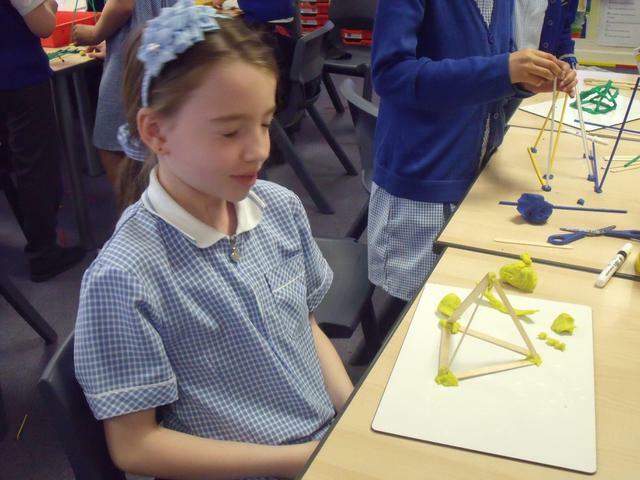 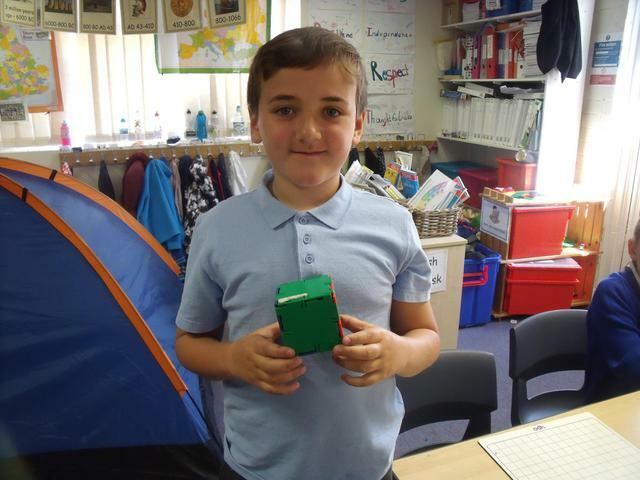 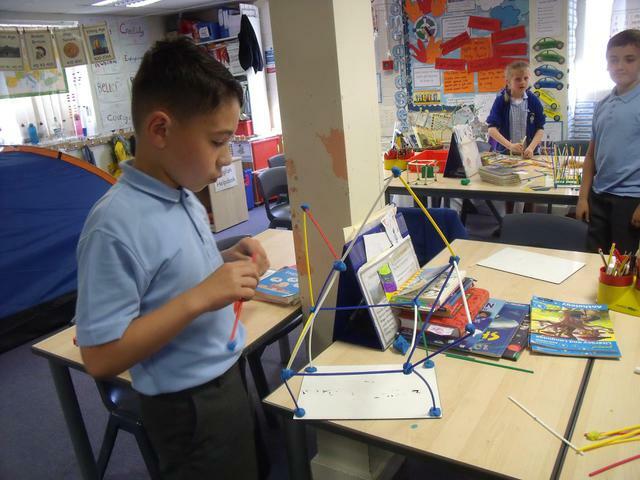 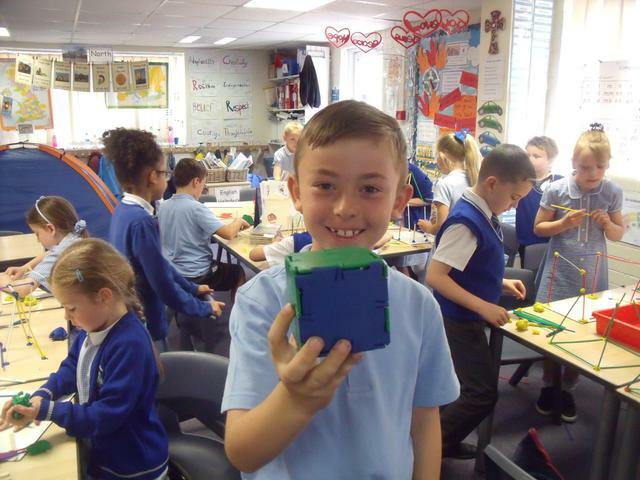 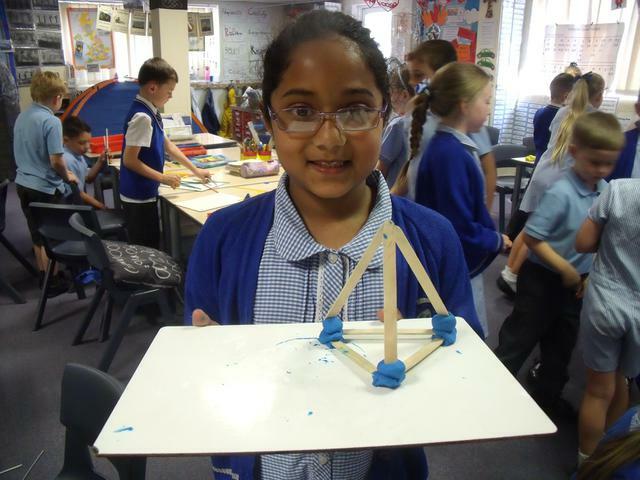 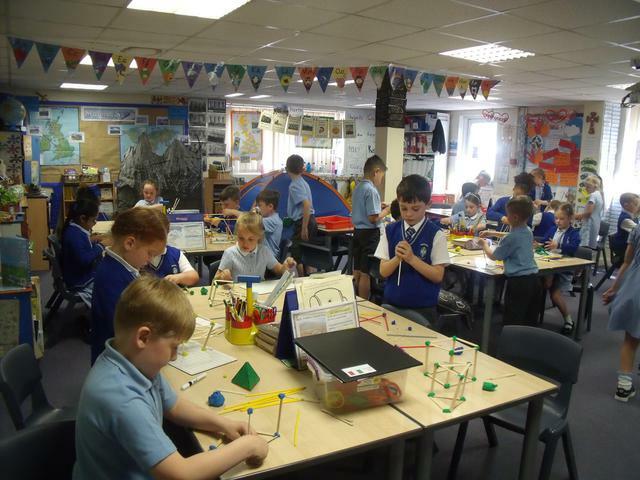 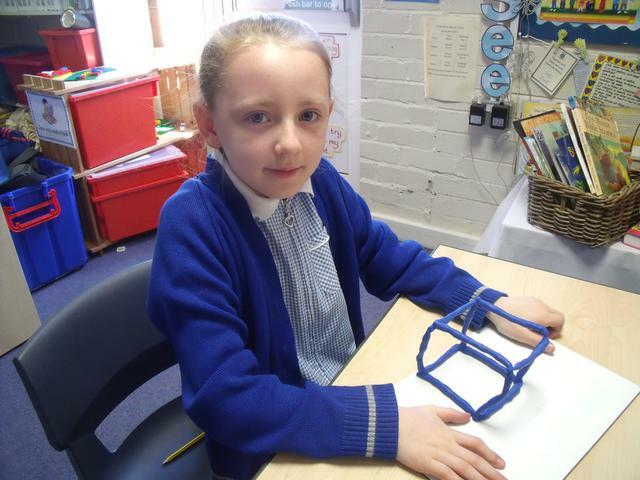 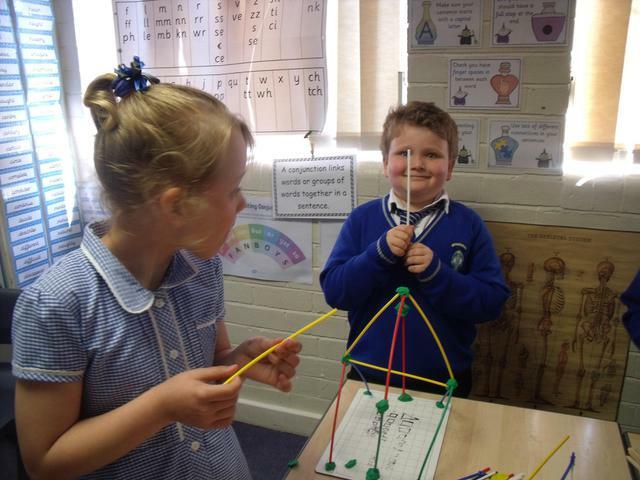 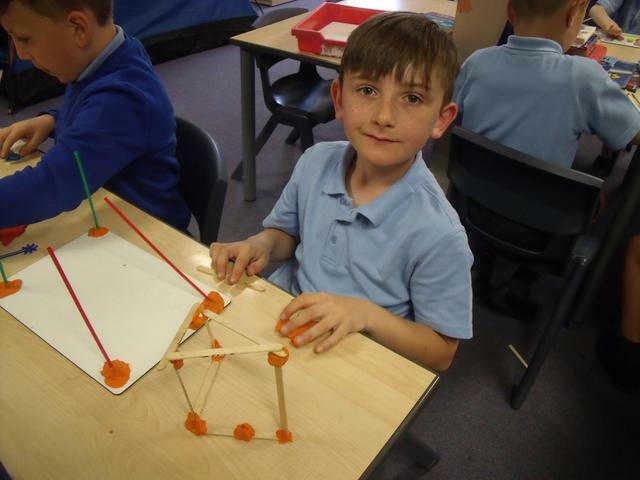 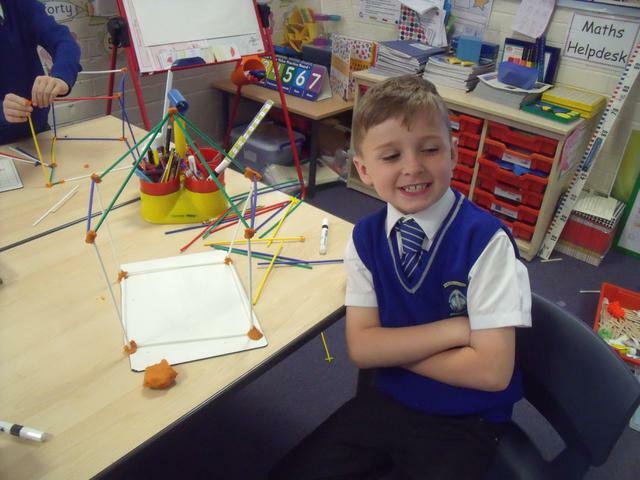 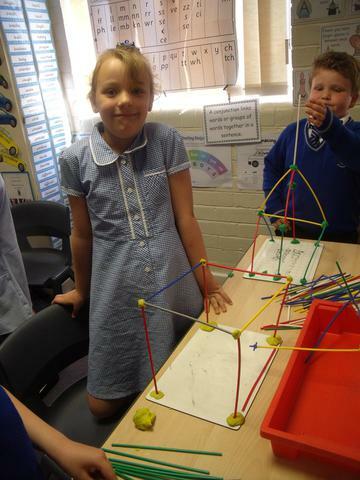 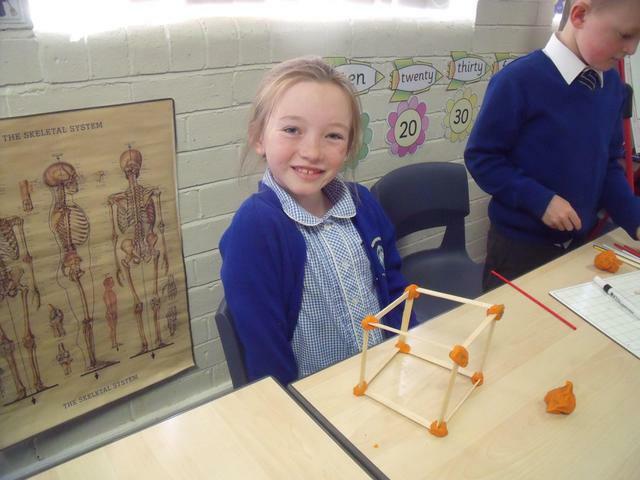 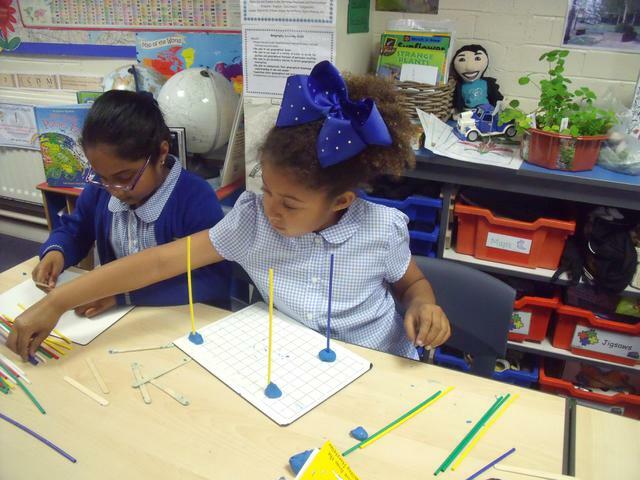 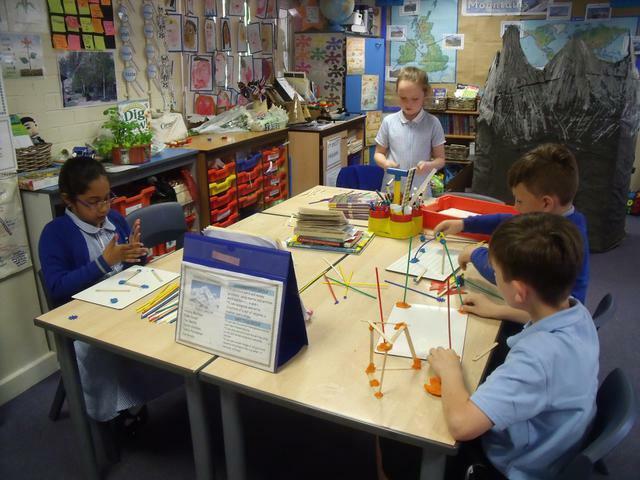 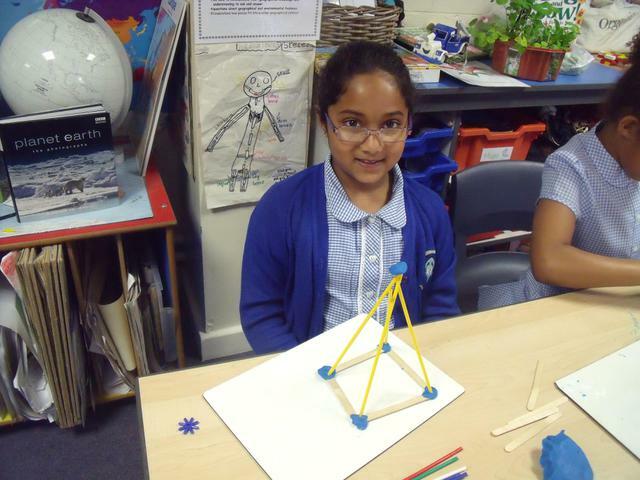 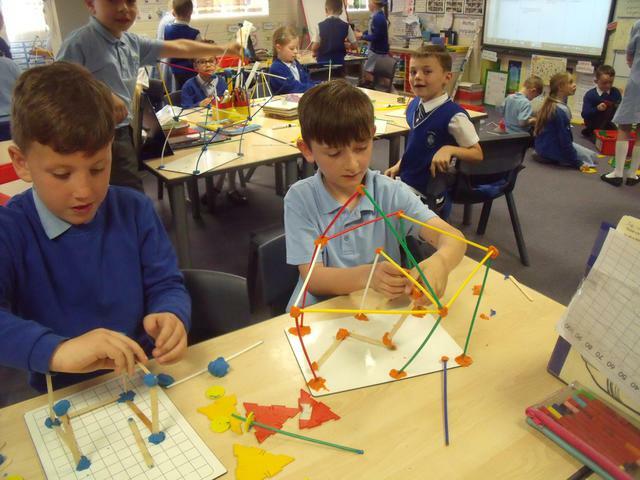 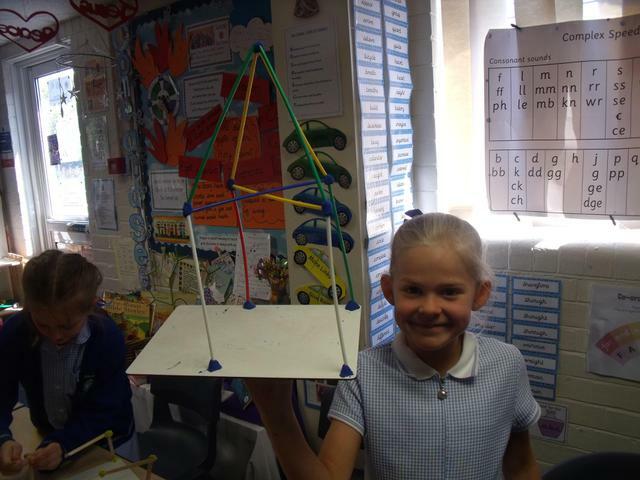 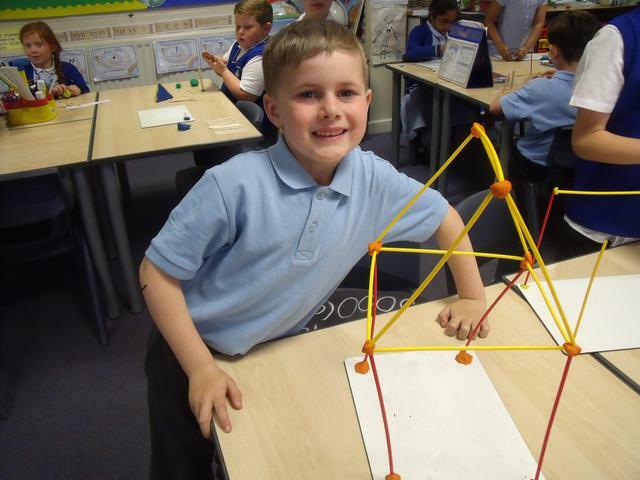 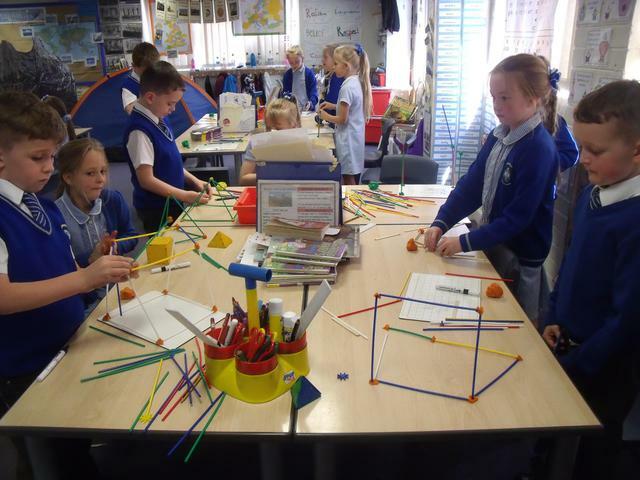 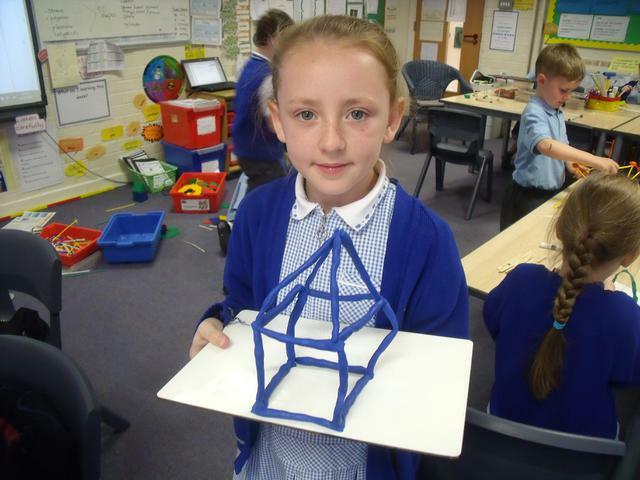 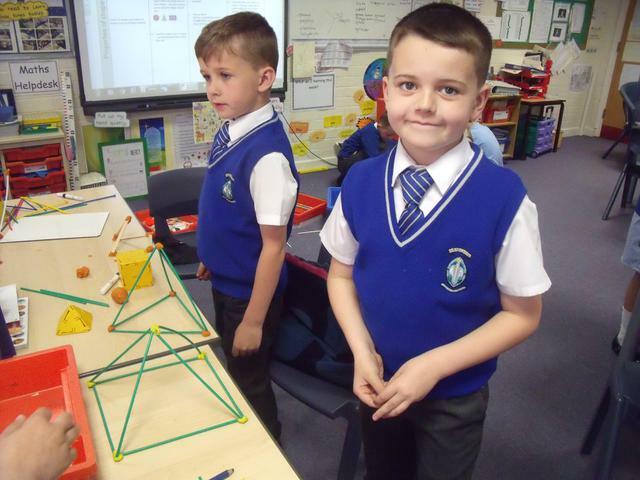 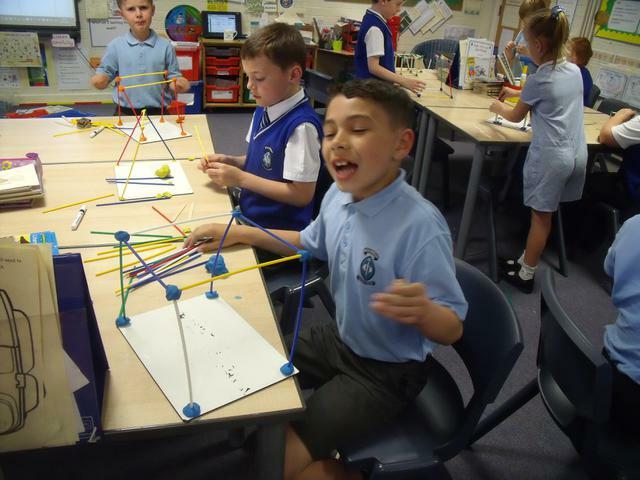 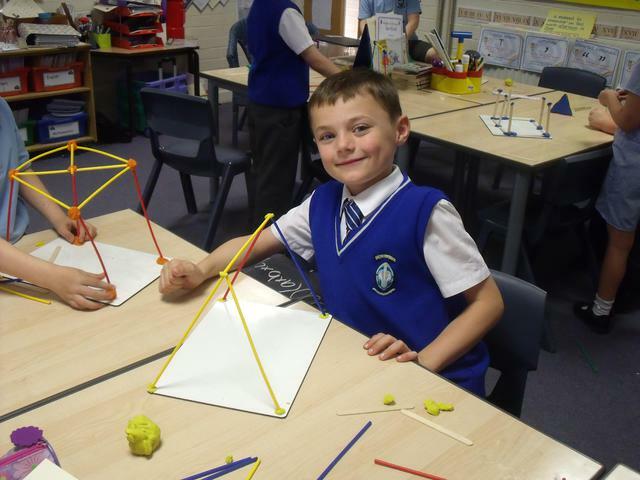 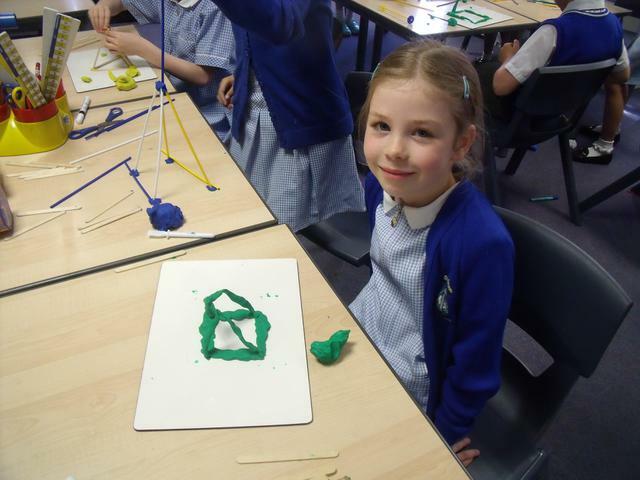 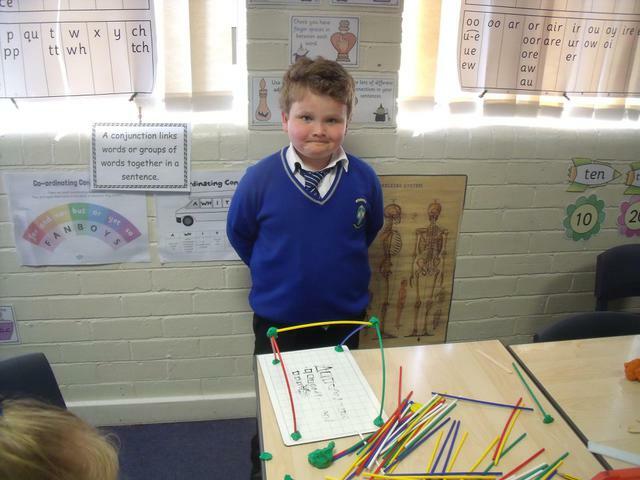 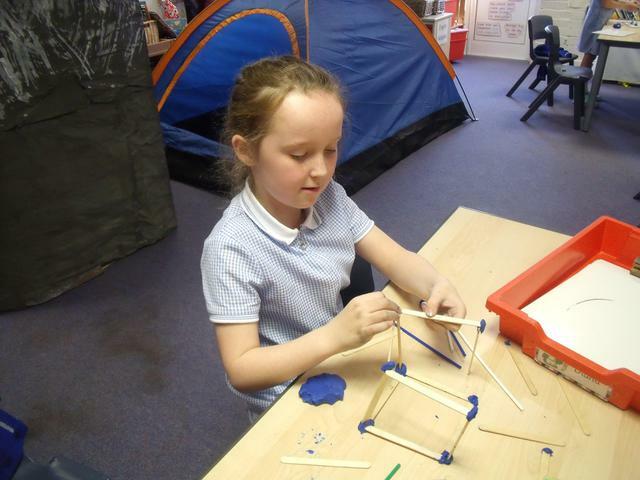 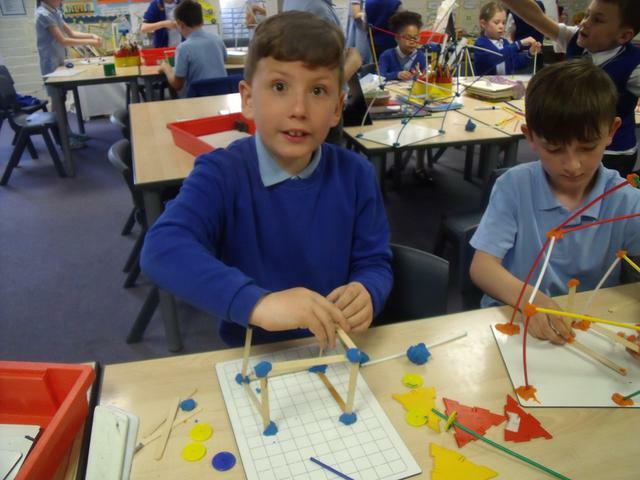 They had fun creating cubes, cuboids, pyramids and prisms. 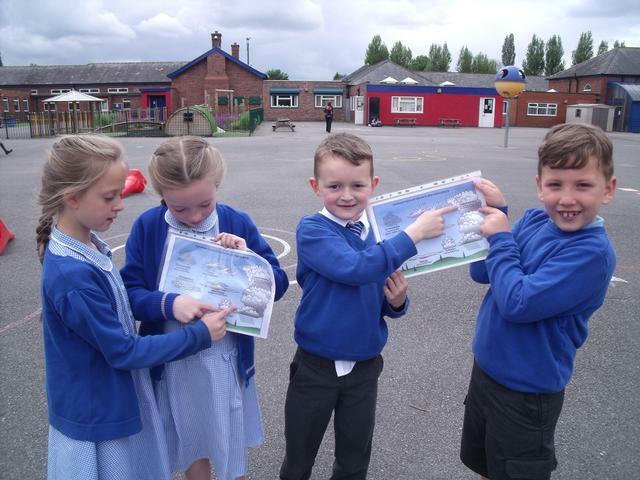 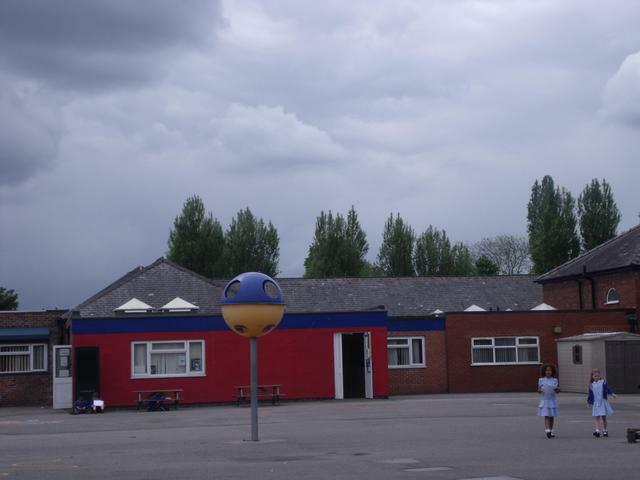 The children went cloud spotting today looking up to the sky to spot cumulus, stratus and cirrus cloud formations. 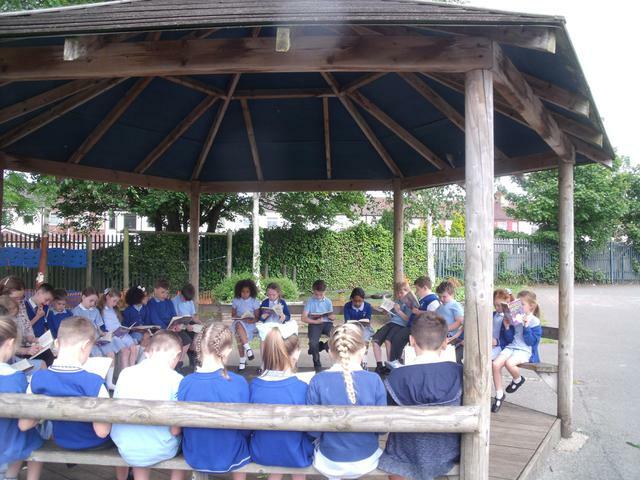 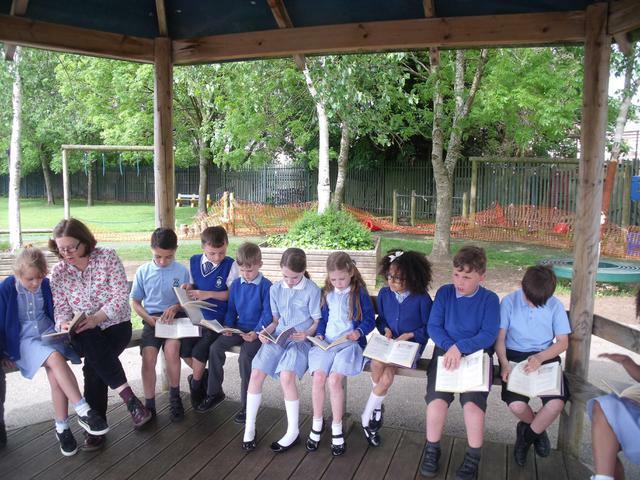 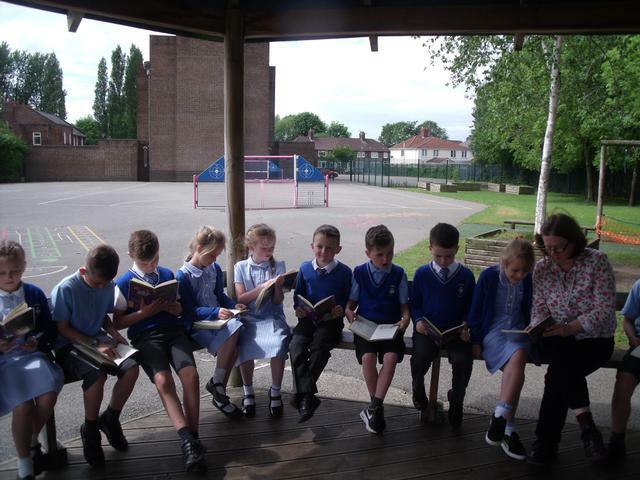 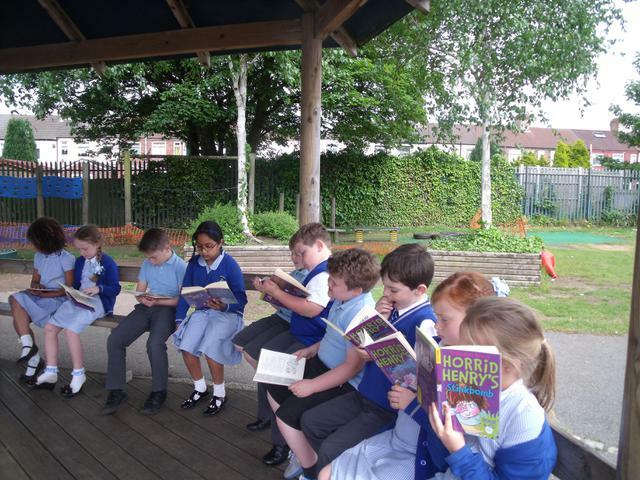 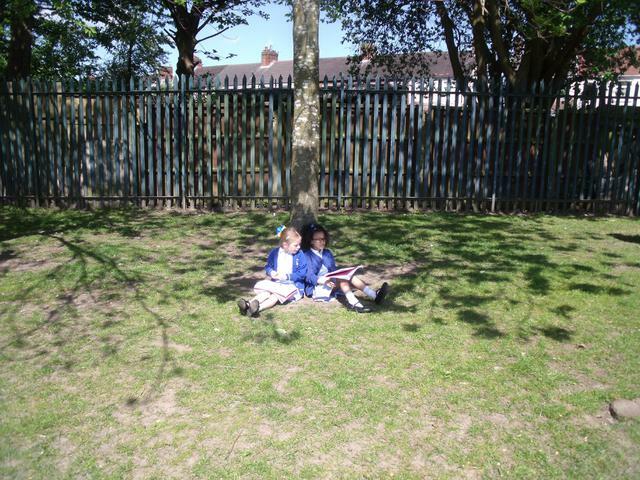 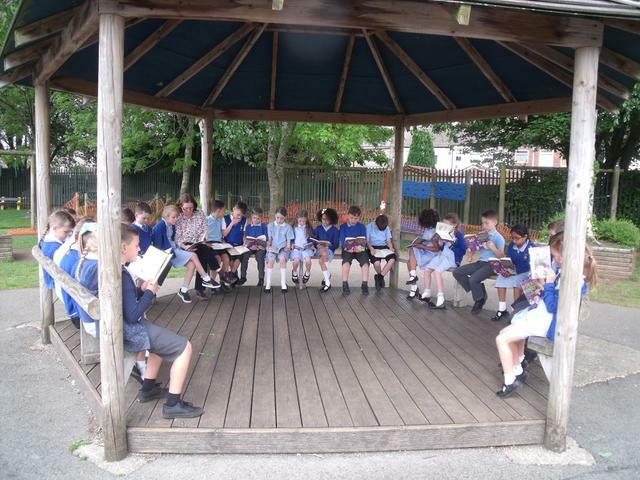 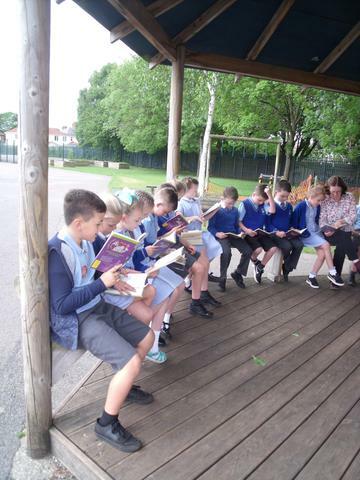 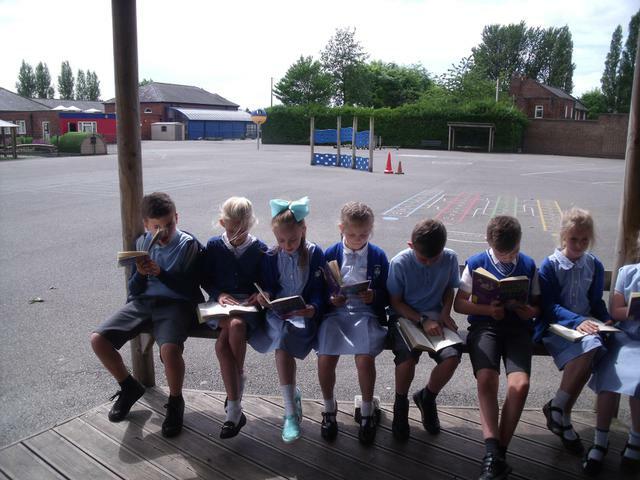 Later we read Horrid Henry under the outdoor shelter. 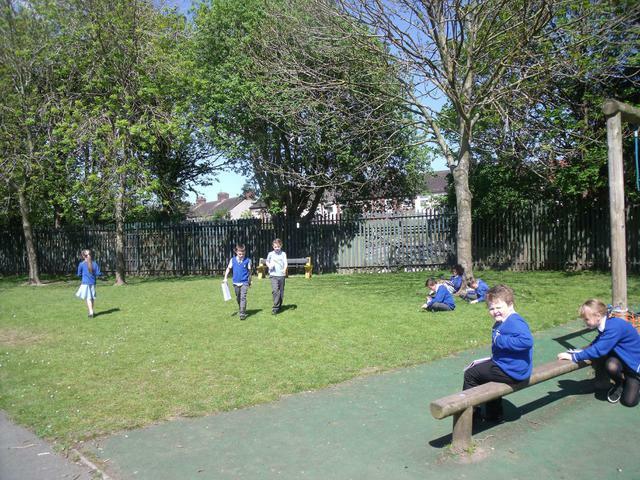 We all enjoyed spending time outdoors. 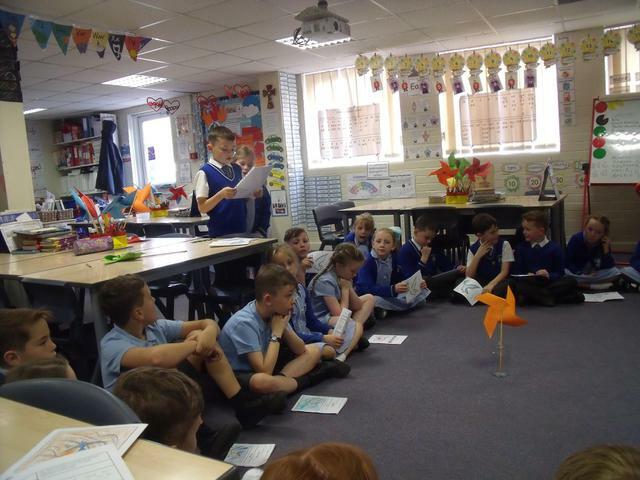 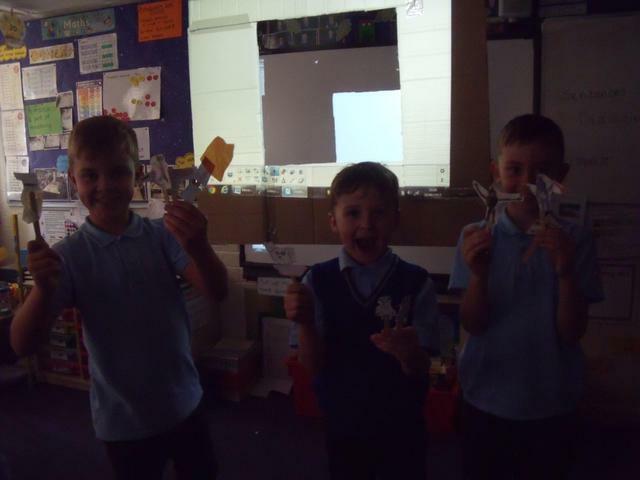 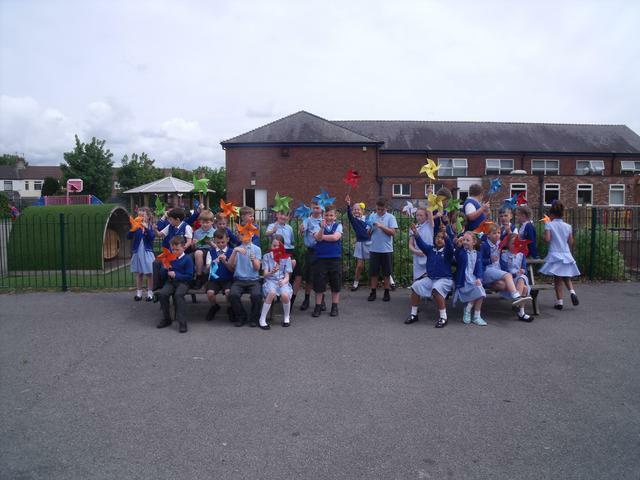 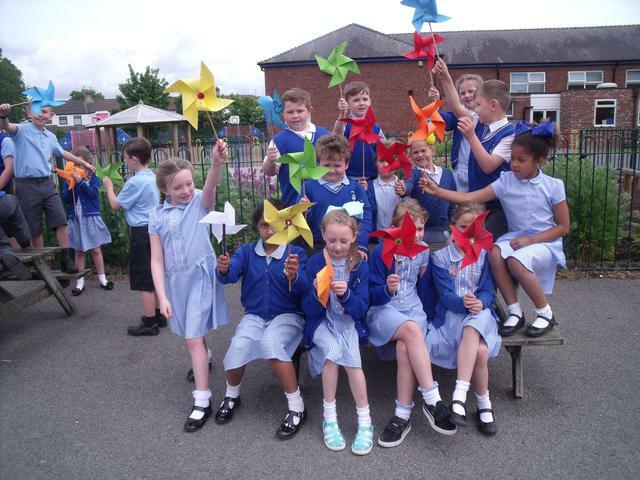 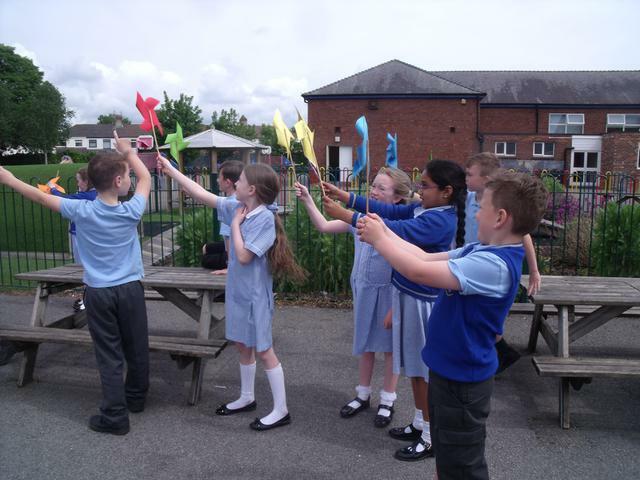 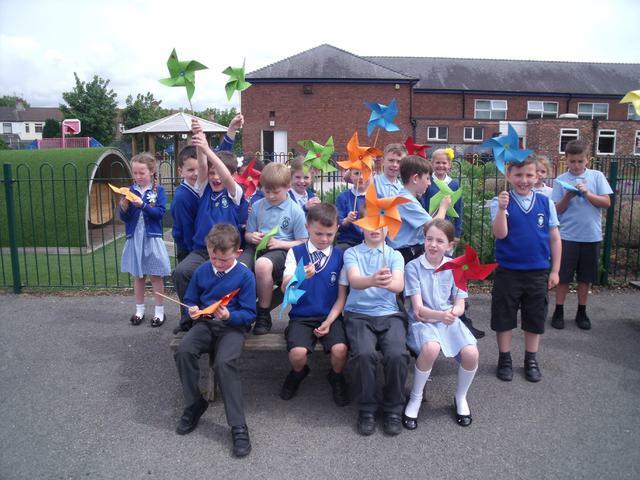 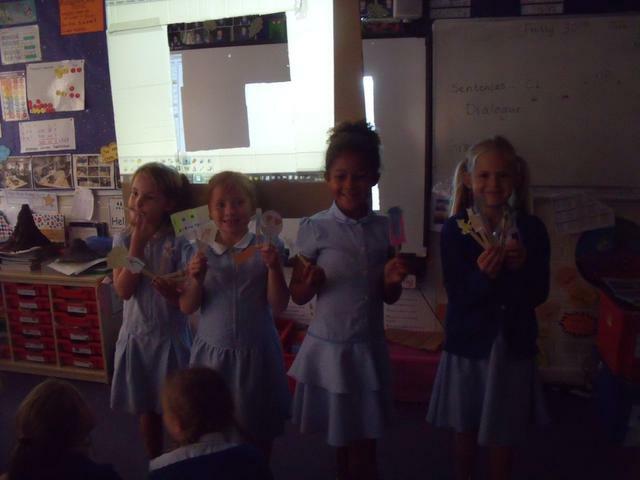 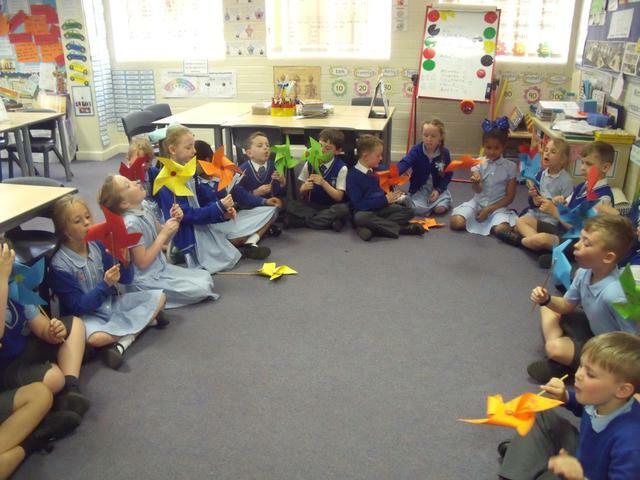 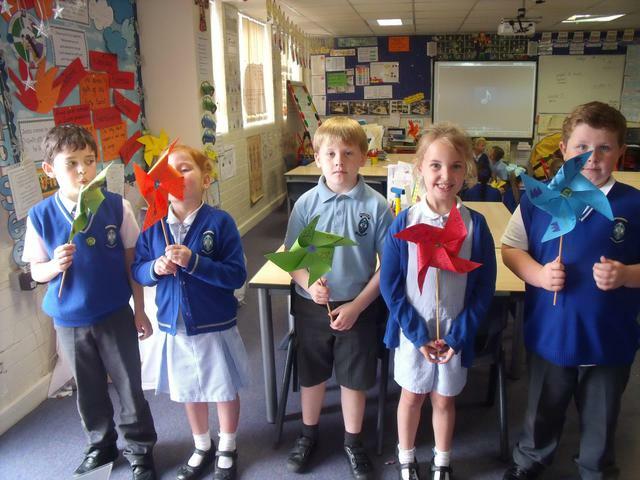 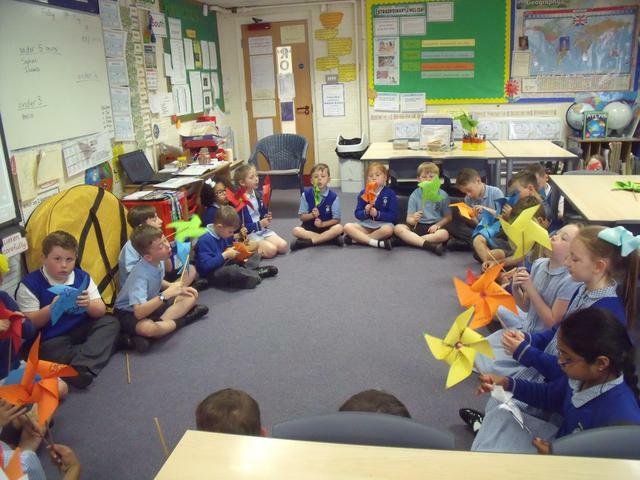 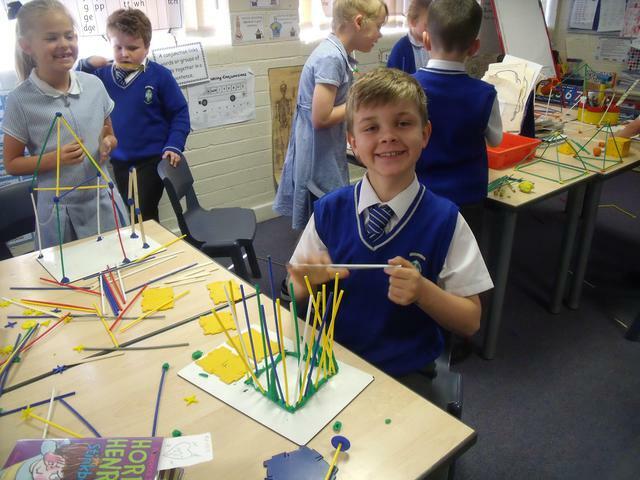 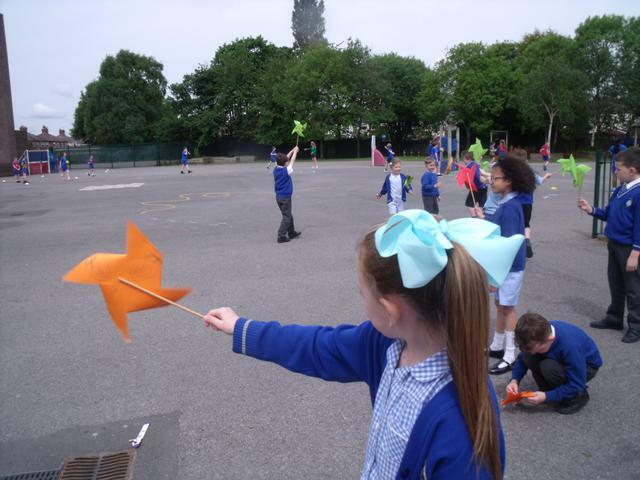 As part of our Come and See topic about Energy in which we learnt about the Gifts of the Holy Spirit, we made windmills to remember the power of the wind in bringing the gifts to the apostles. 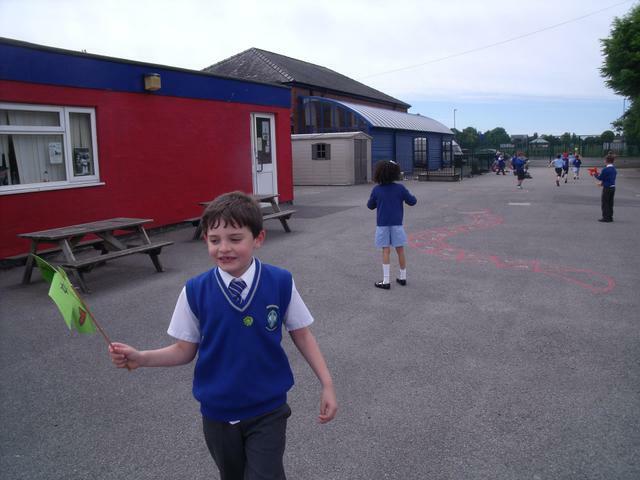 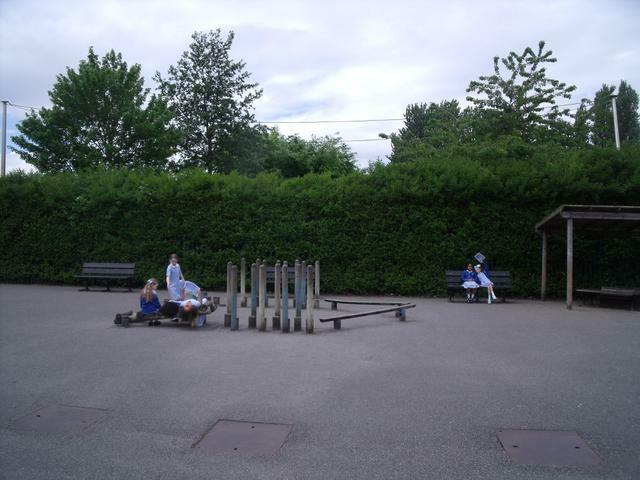 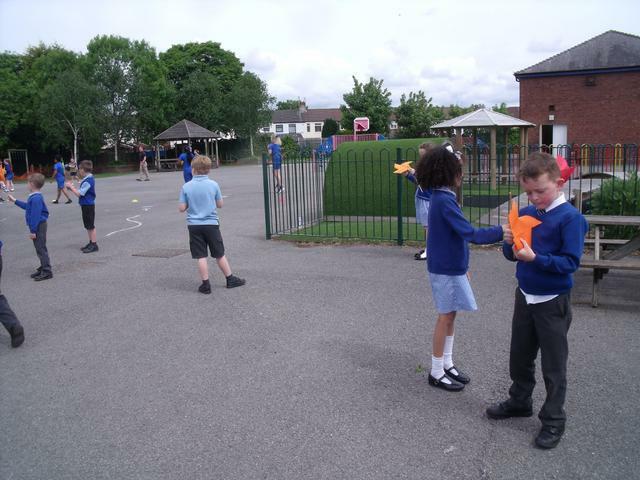 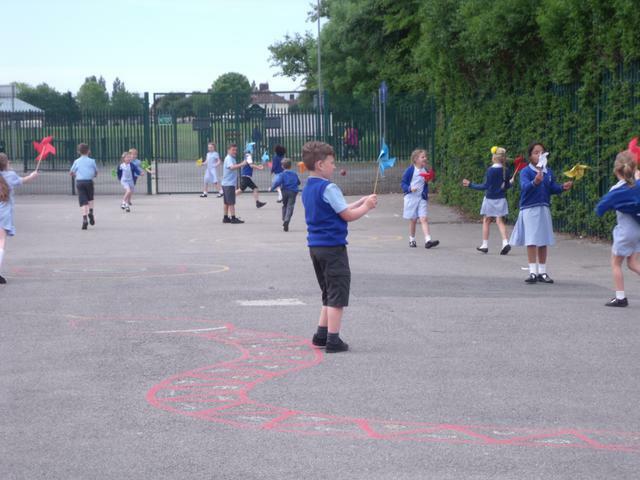 We had a great time experimenting with them outside, running around the playground observing how the wind made them spin. 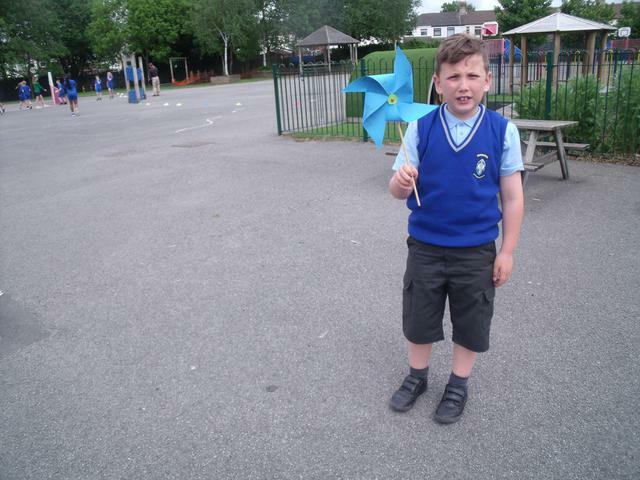 we were also able to investigate from which direction was blowing from. 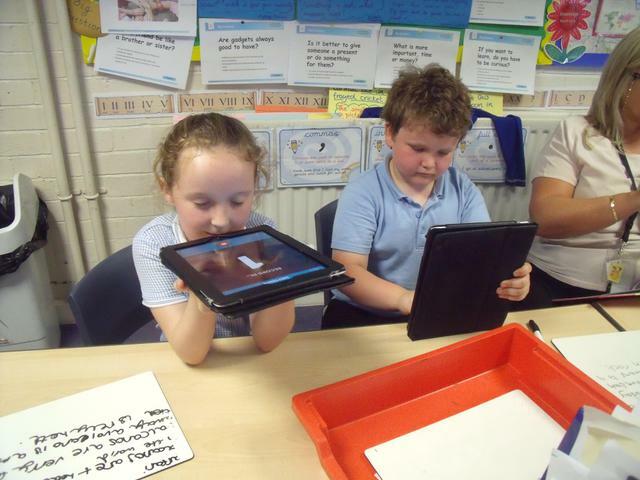 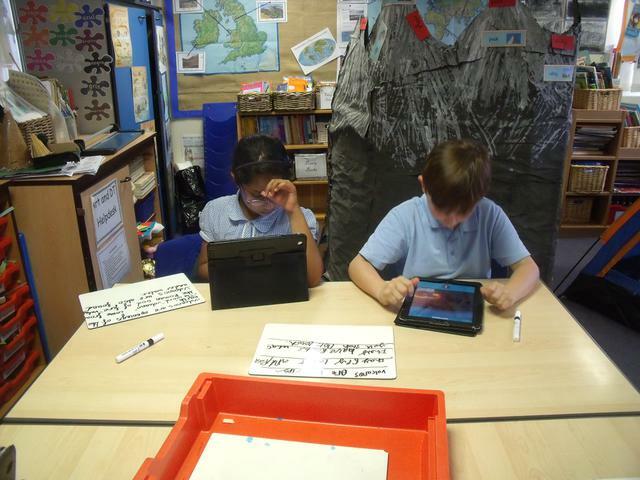 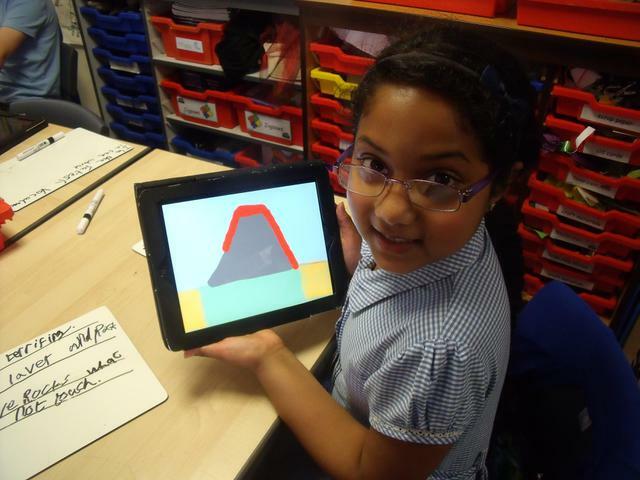 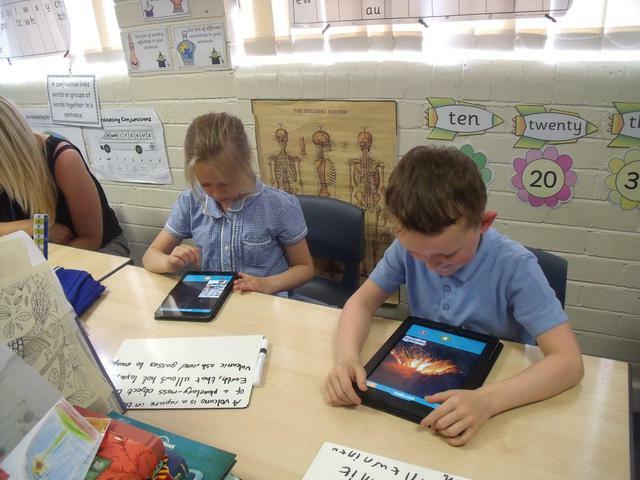 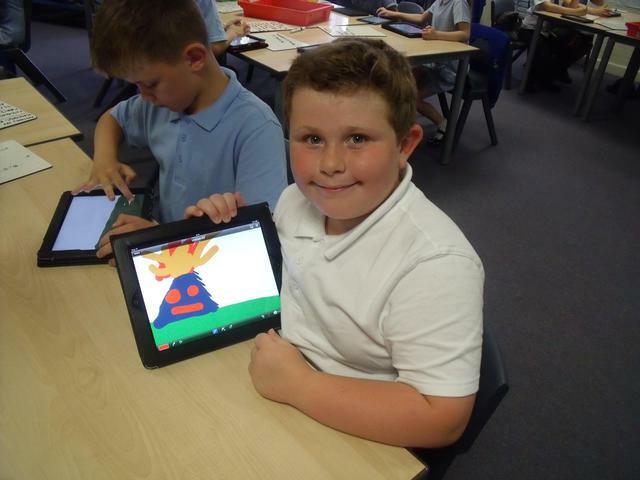 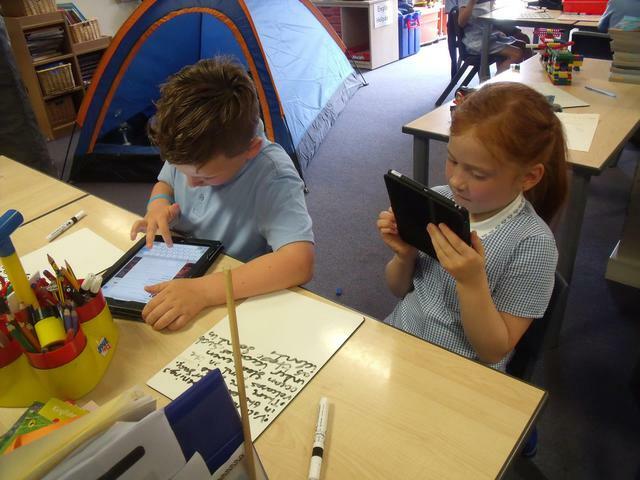 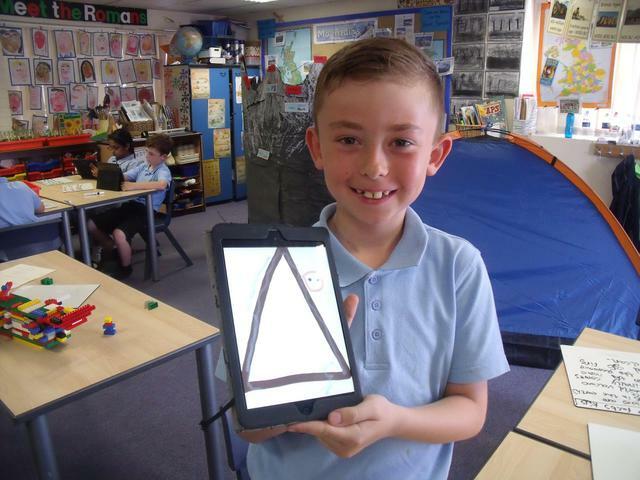 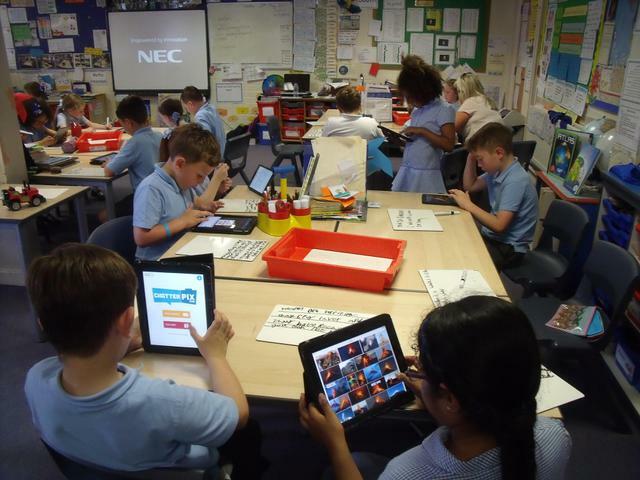 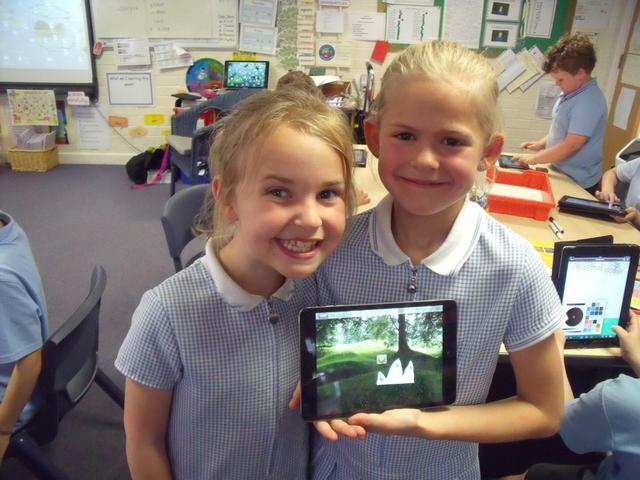 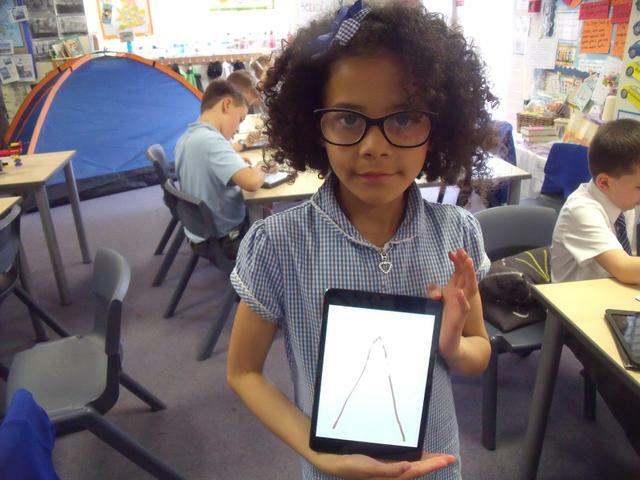 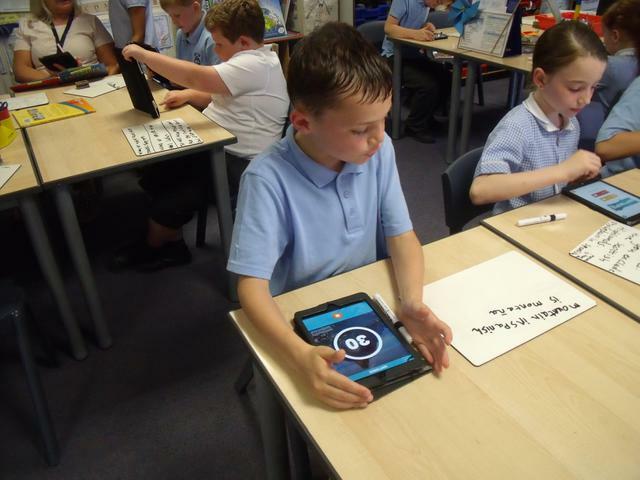 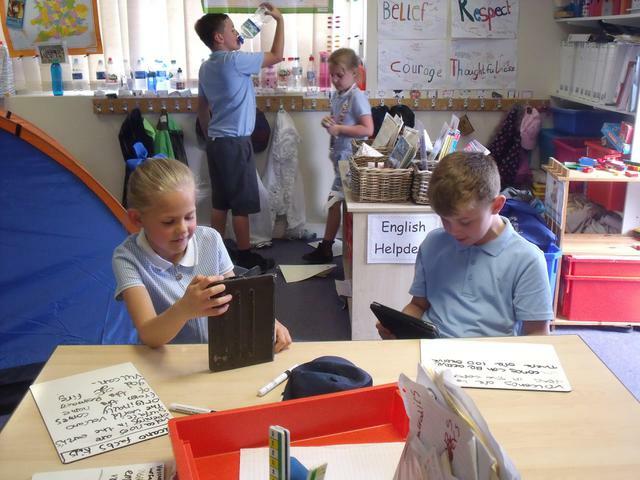 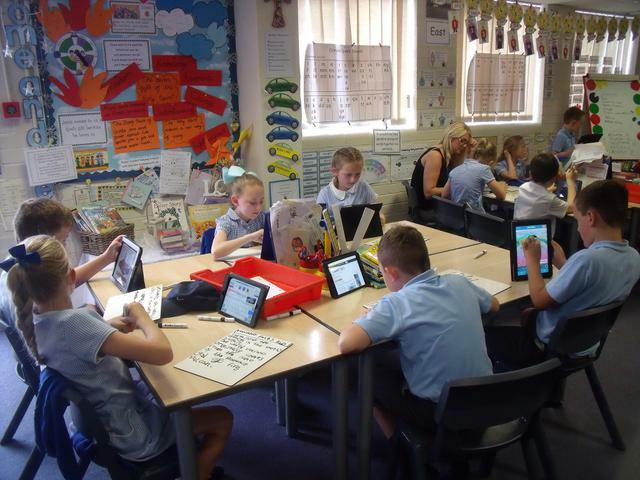 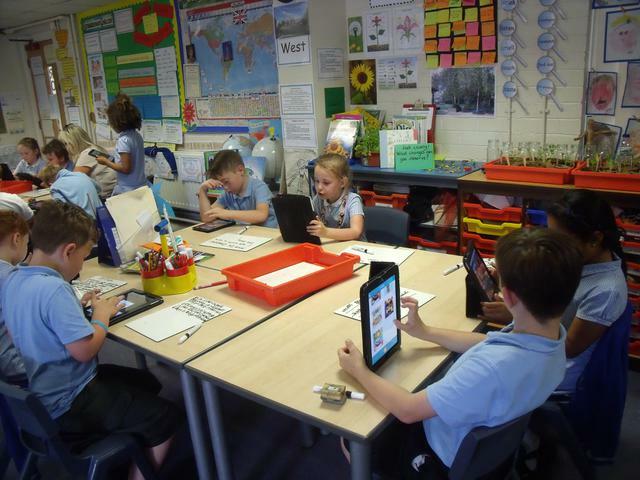 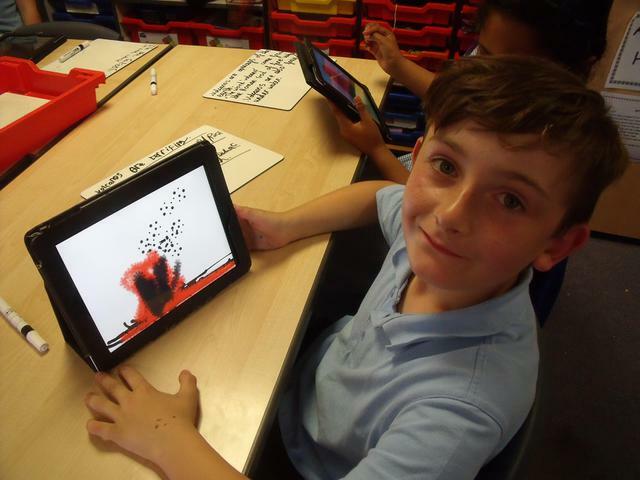 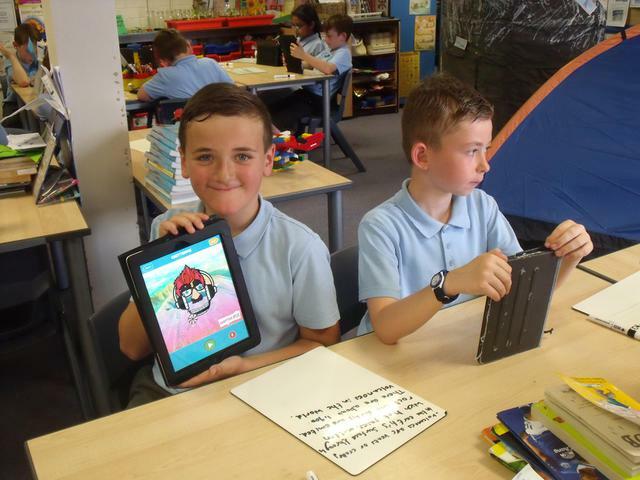 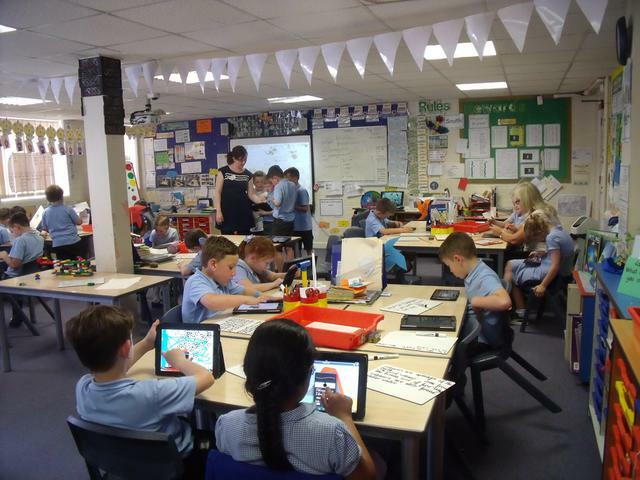 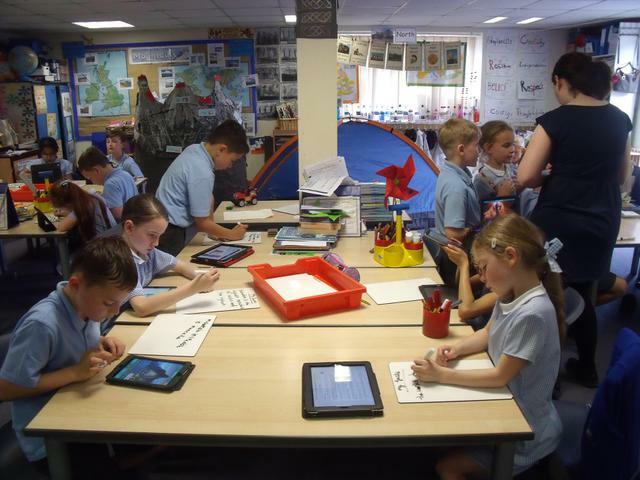 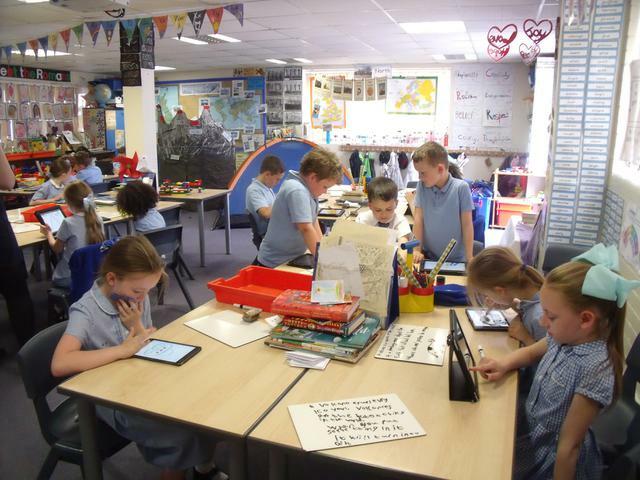 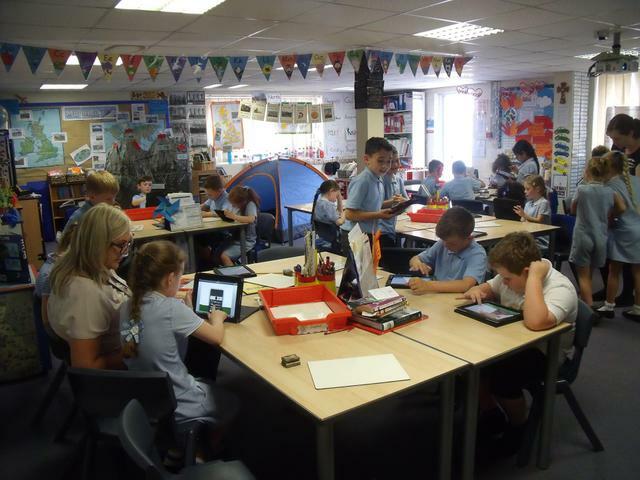 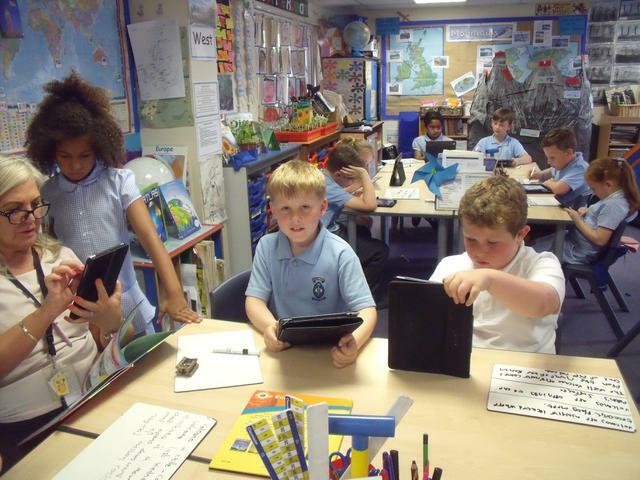 The children had the opportunity to work with the iPads this afternoon using Chatterpix and PuppetPals Apps to produce some work about mountains and volcanoes. 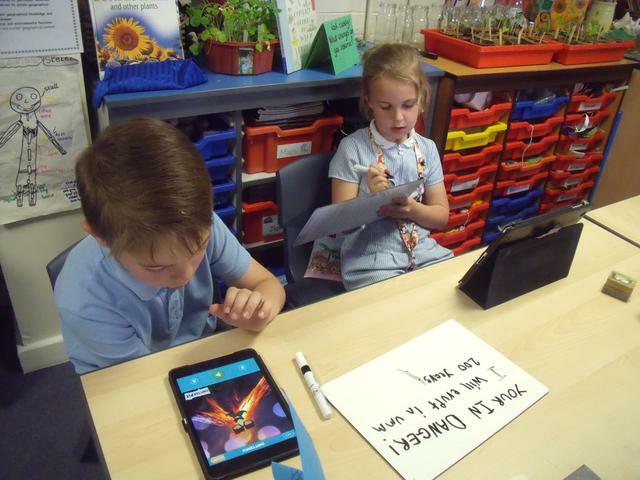 They had to find out some facts about mountains/volcanoes, then find an image so that they could add sound and pictures to create a final picture on Chatterpix. 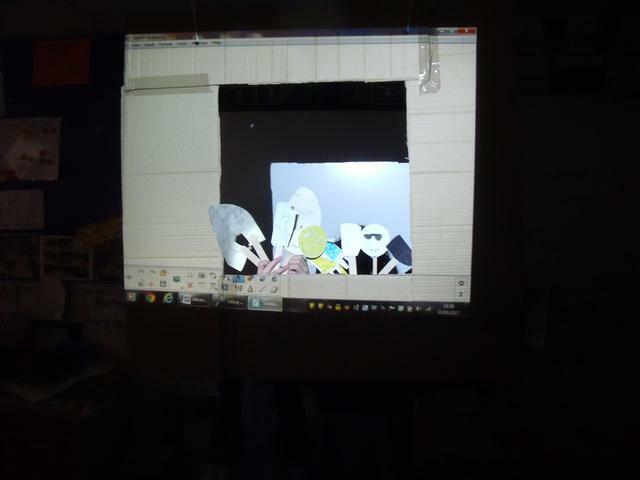 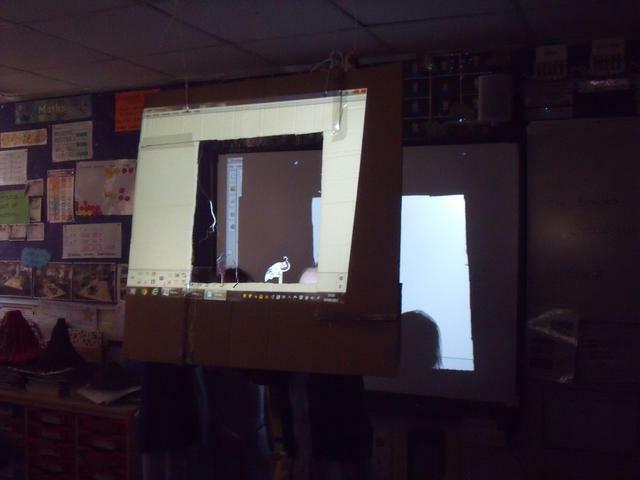 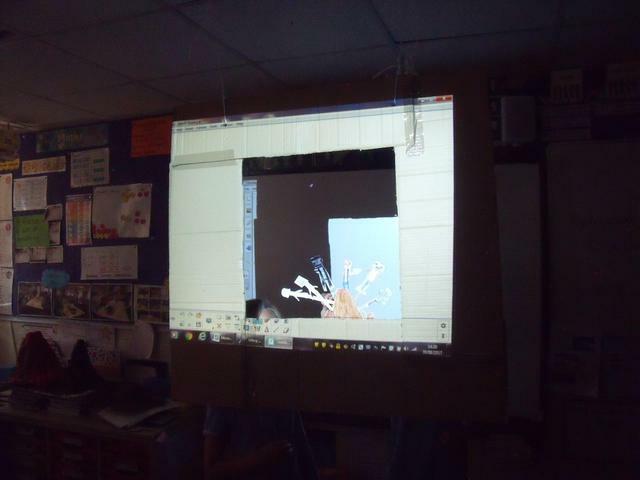 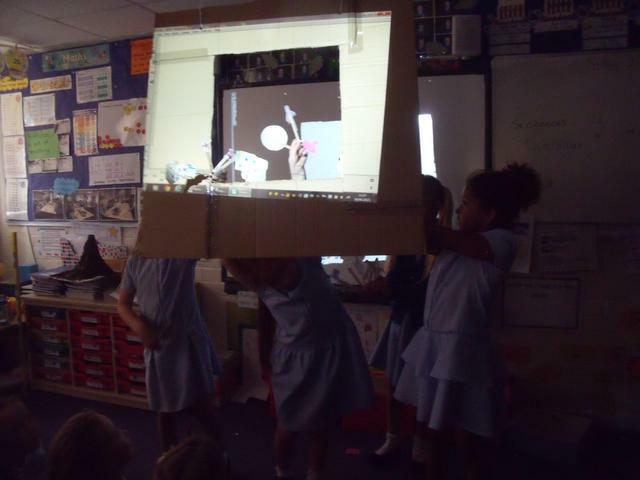 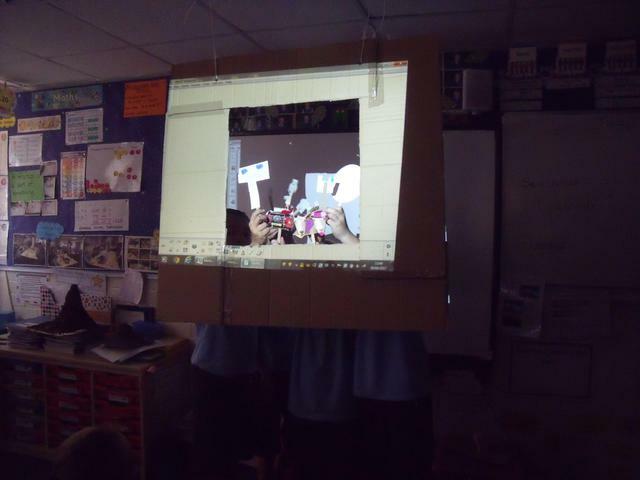 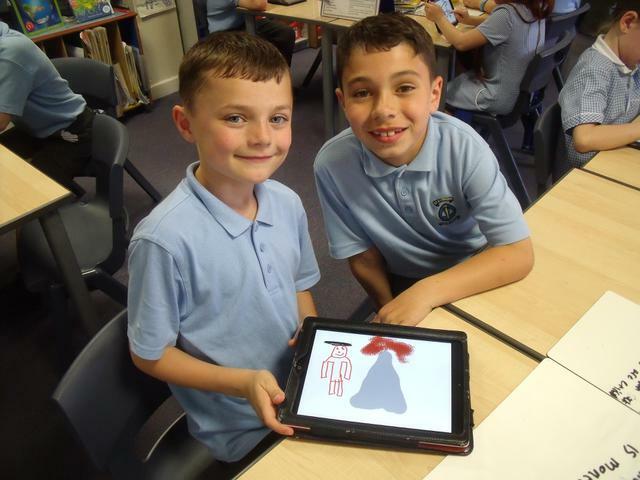 Some children used PuppetPals to create a little puppet show with images or pictures they had drawn. 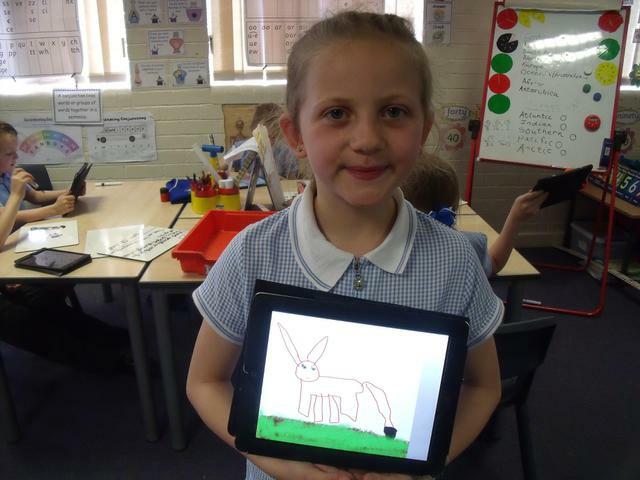 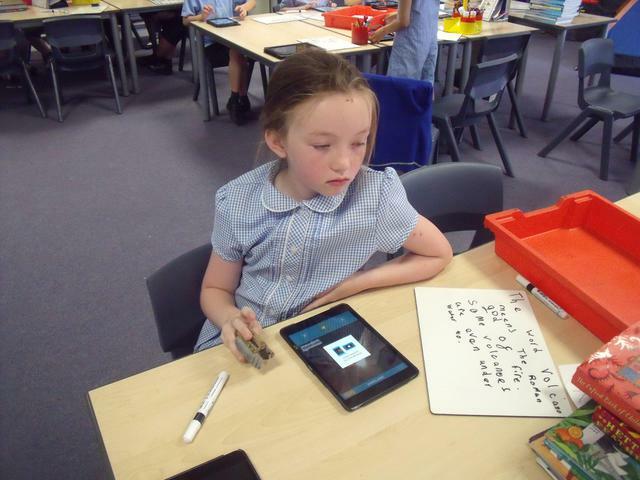 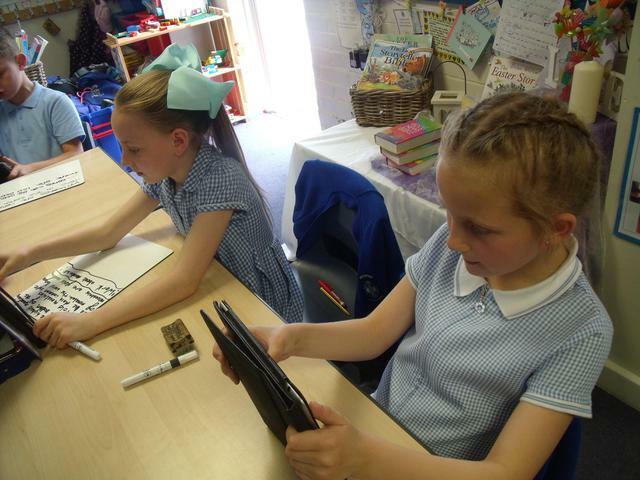 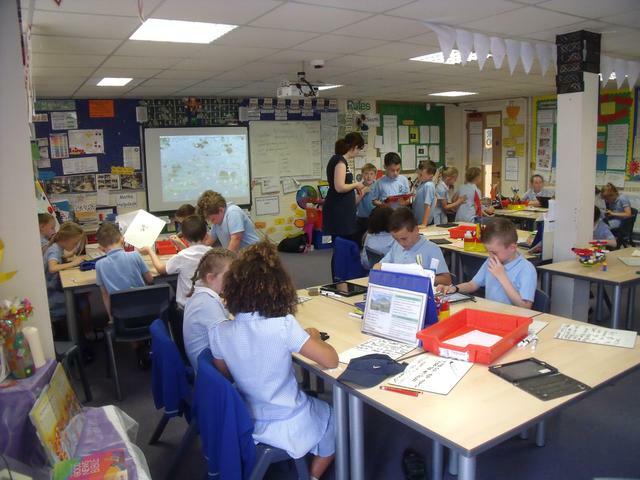 Your children really impressed me with their technological and iPad knowledge! 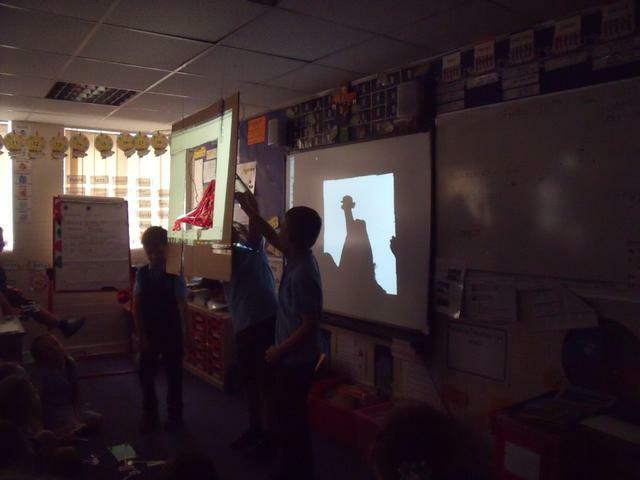 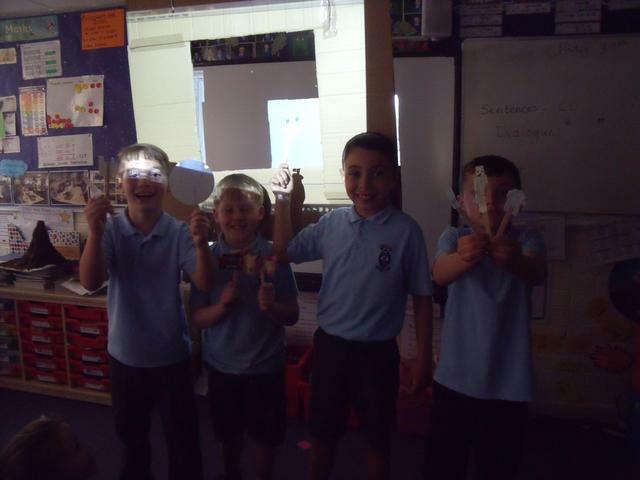 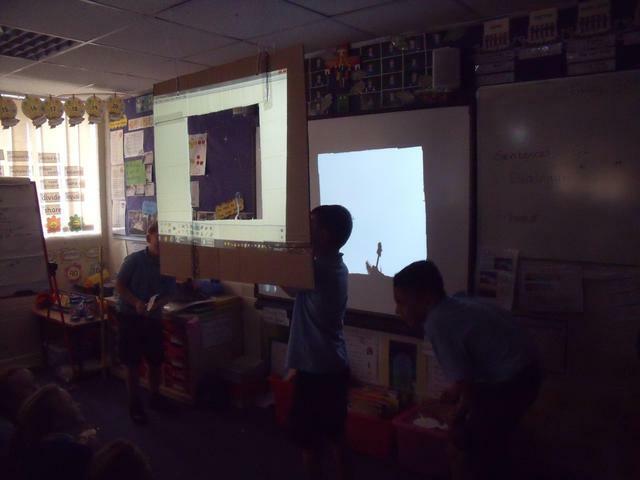 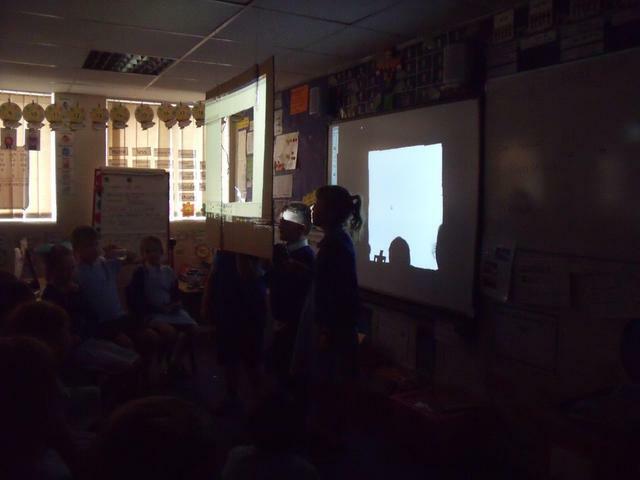 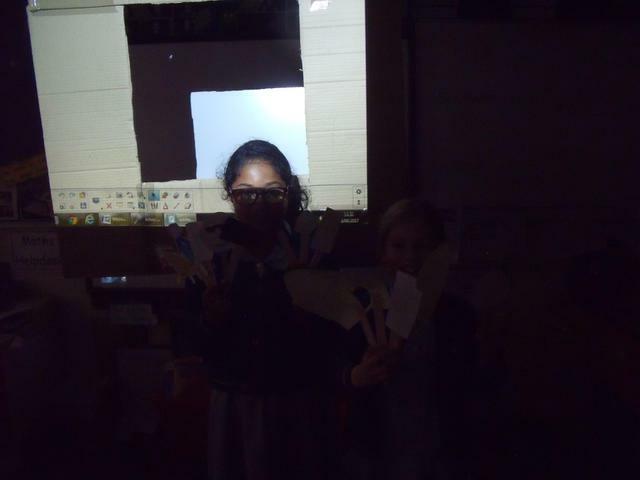 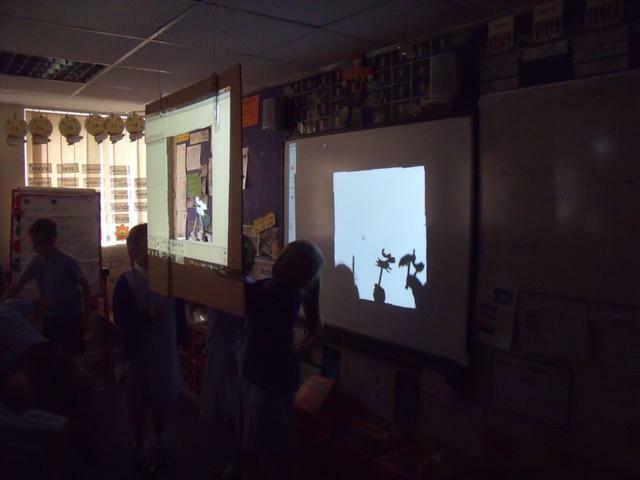 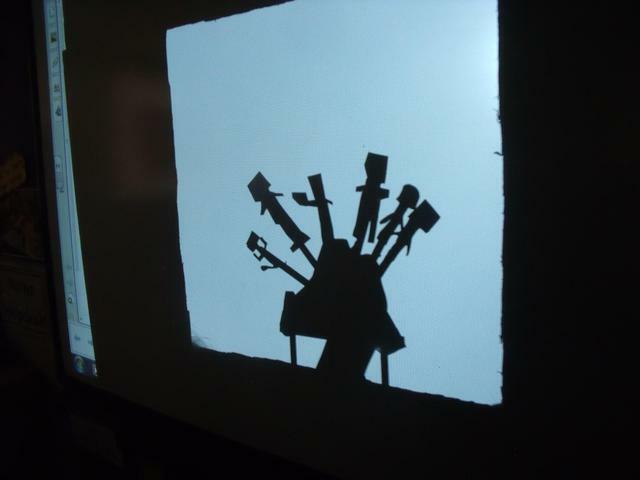 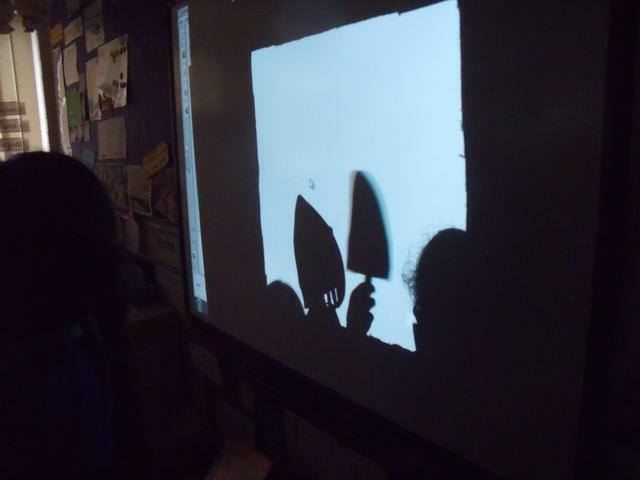 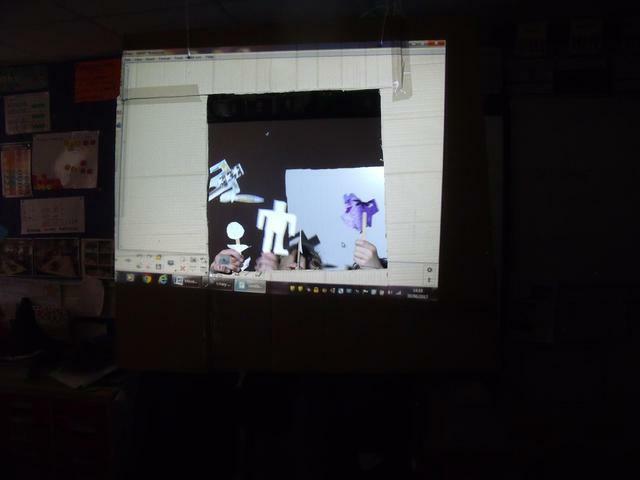 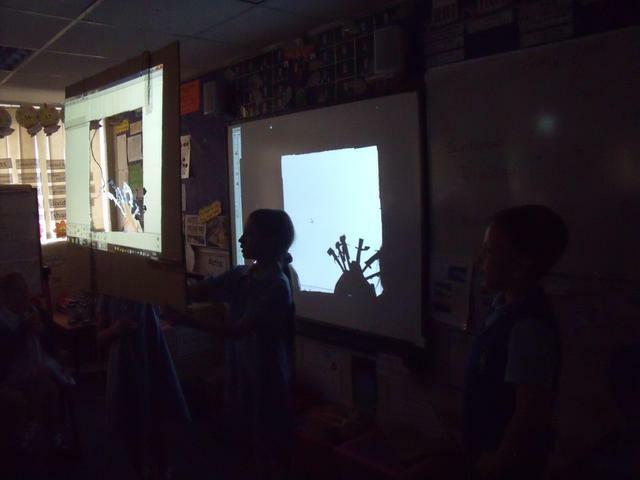 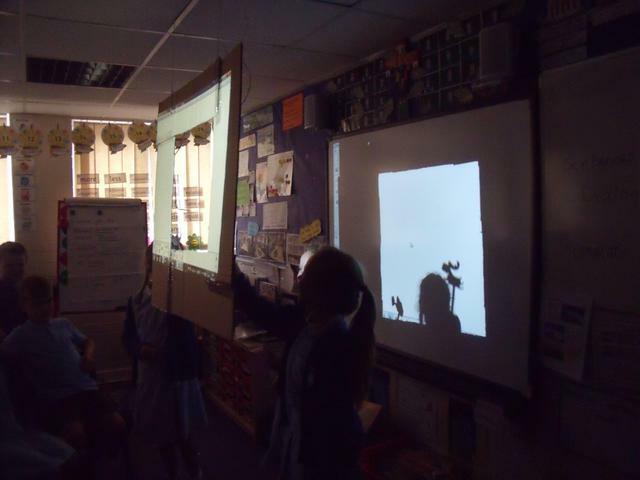 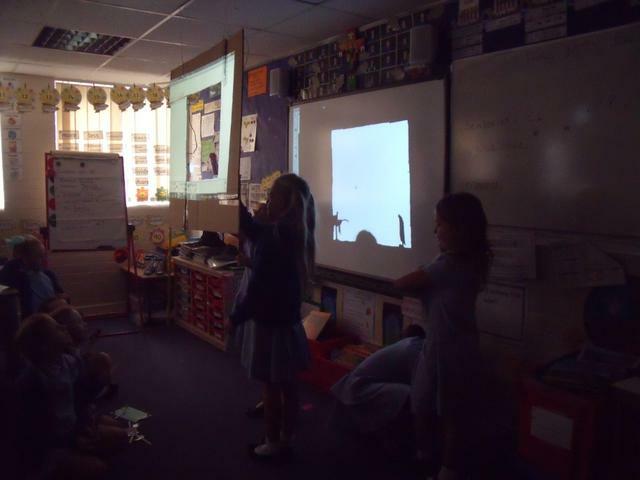 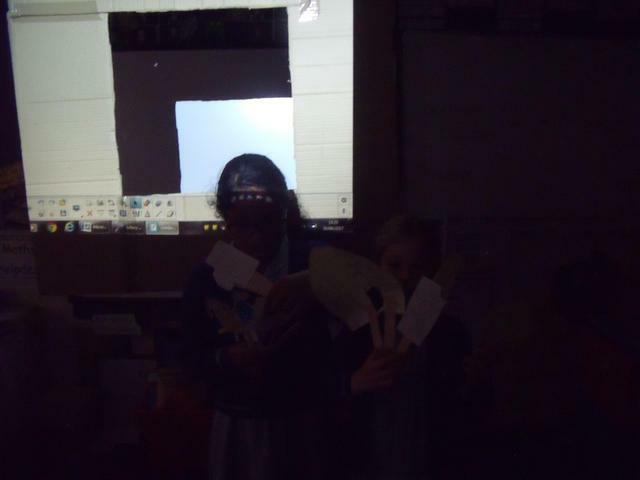 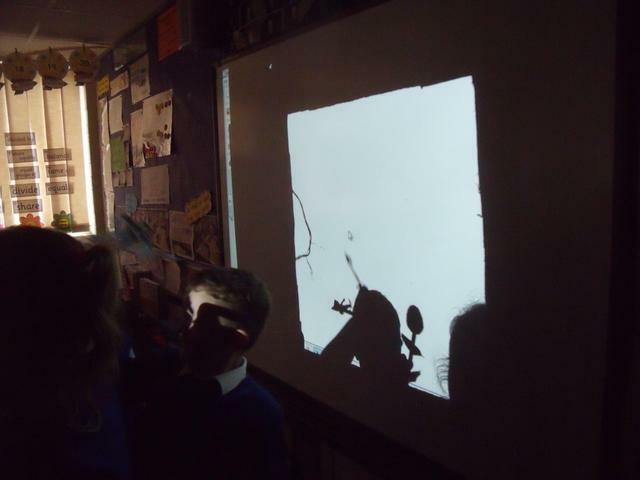 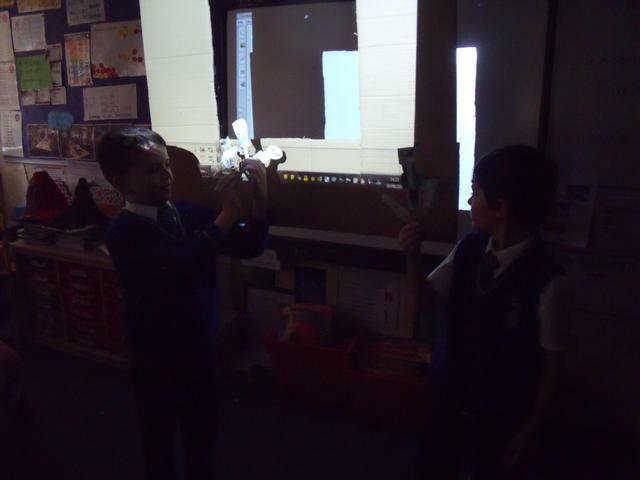 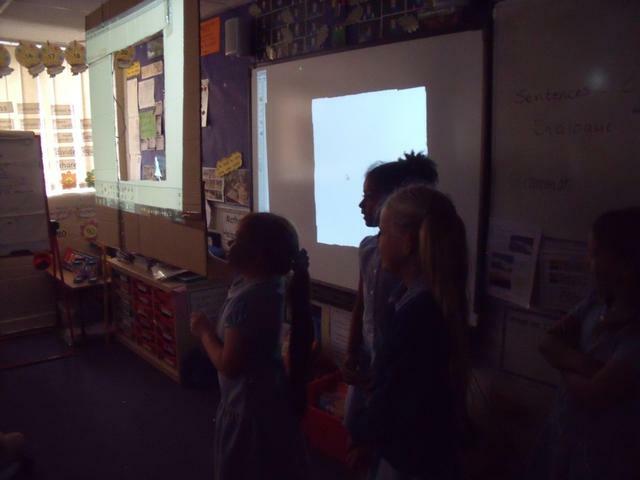 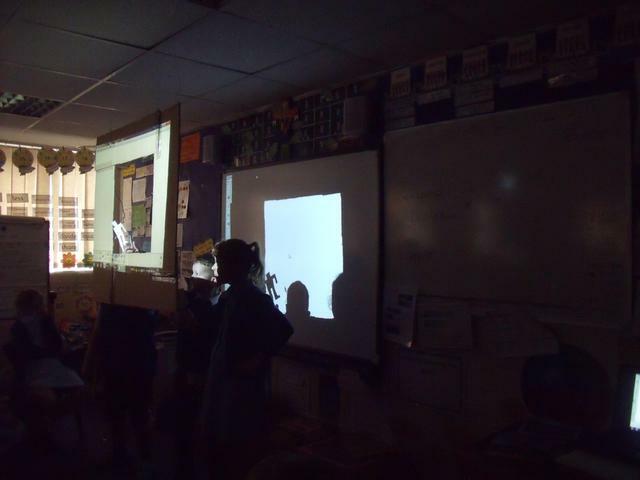 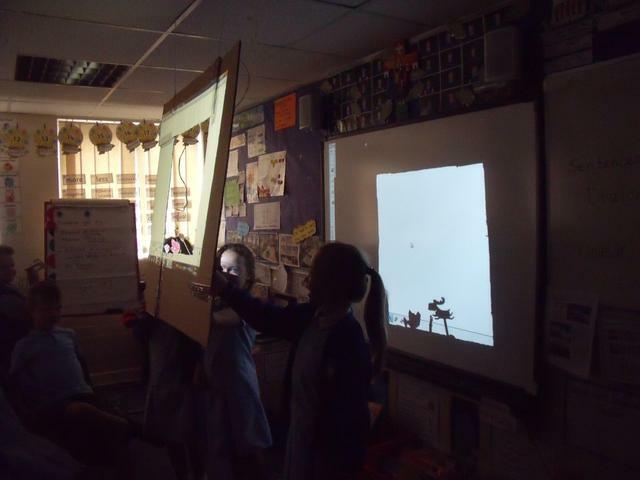 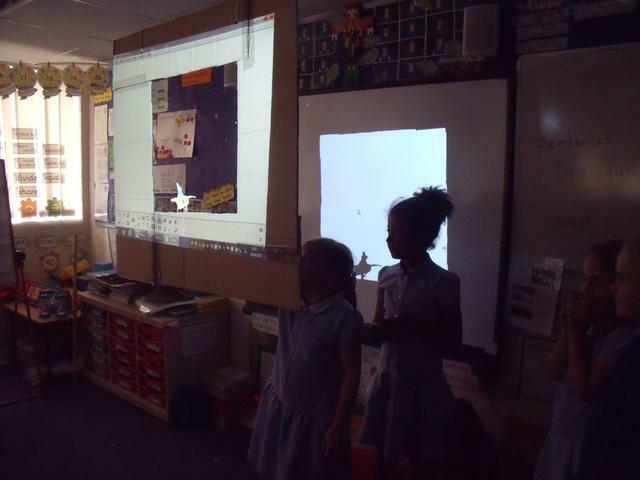 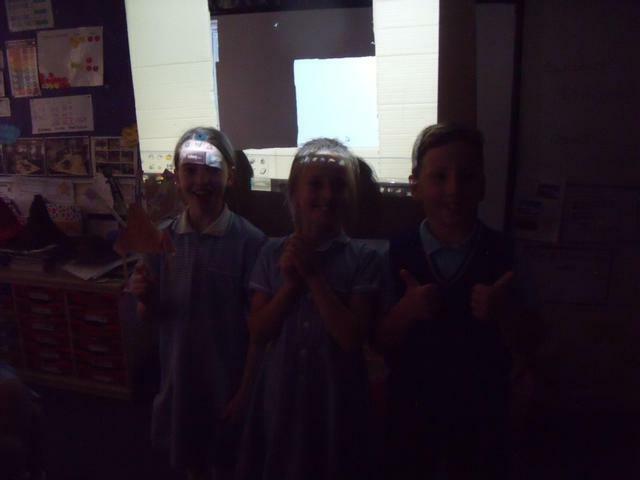 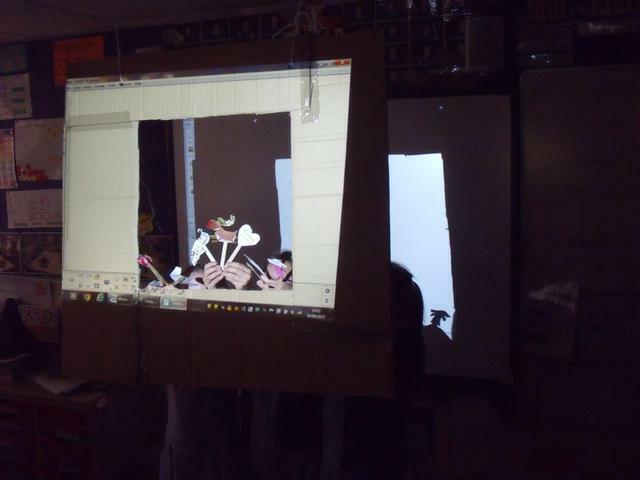 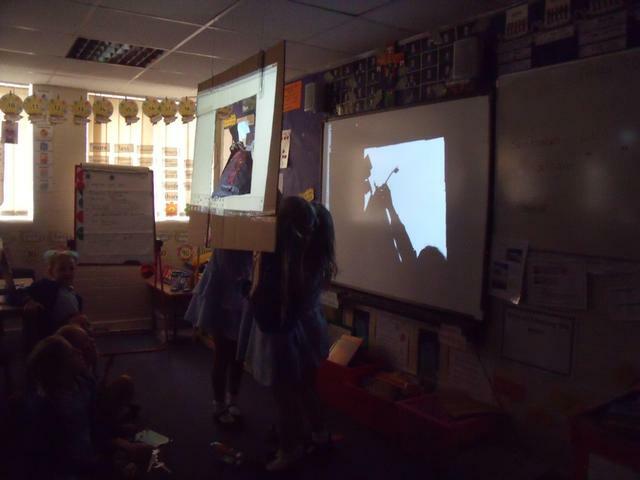 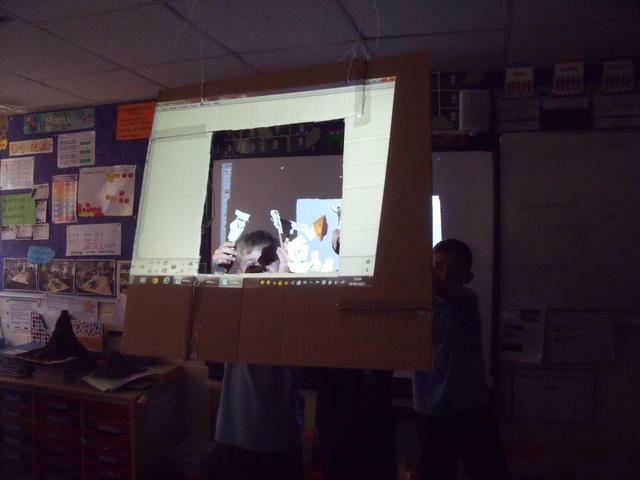 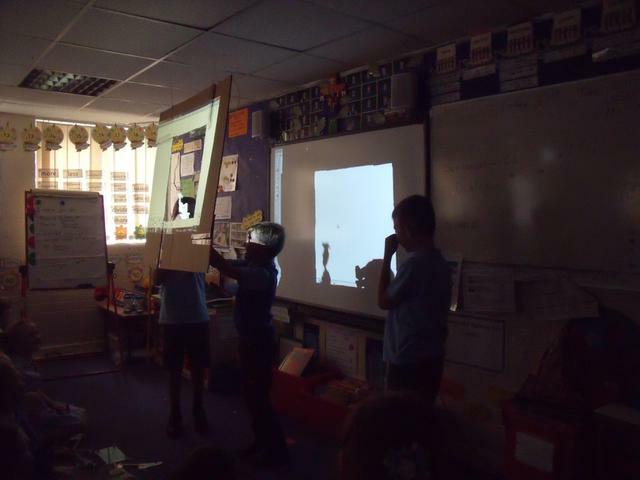 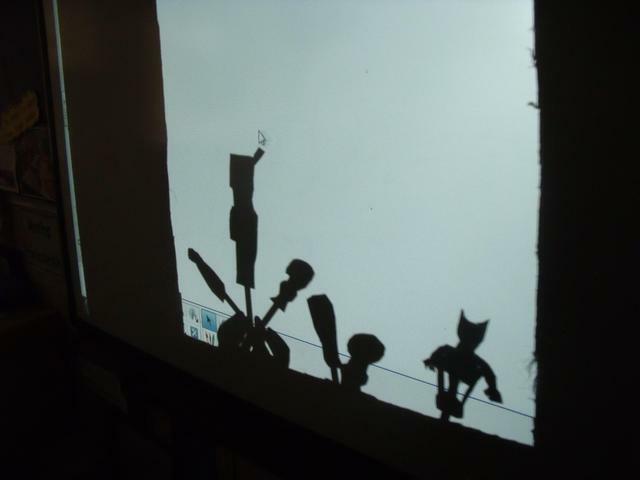 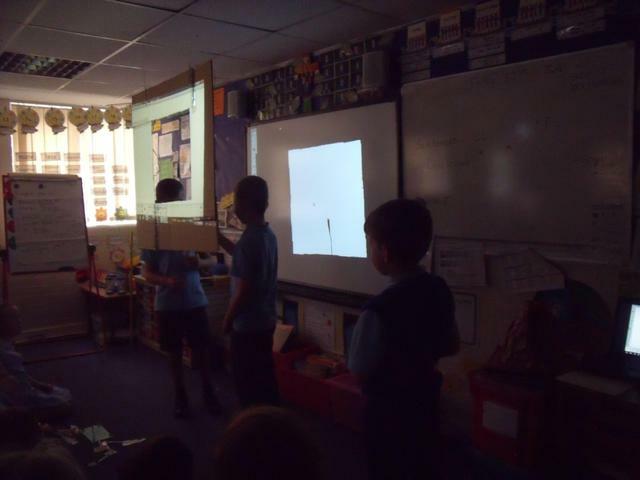 The children made shadow puppets and then put on a Shadow Puppet Show for everyone in class. 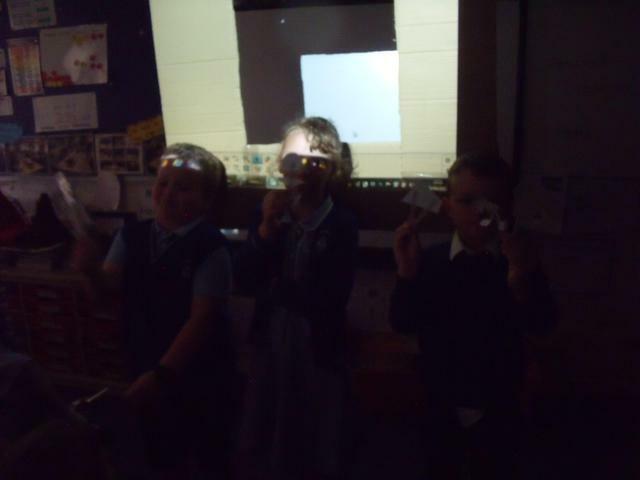 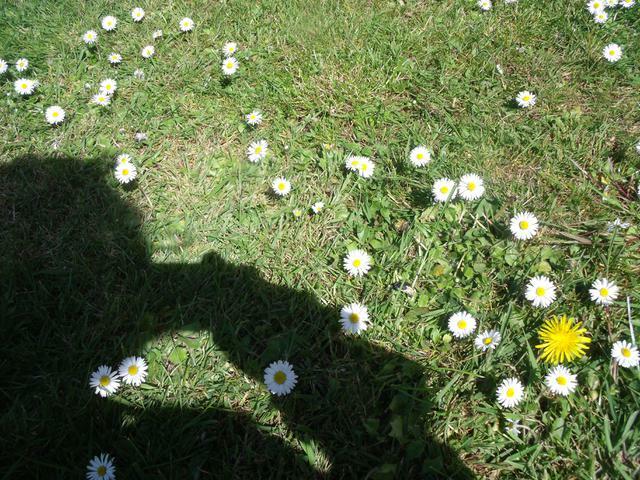 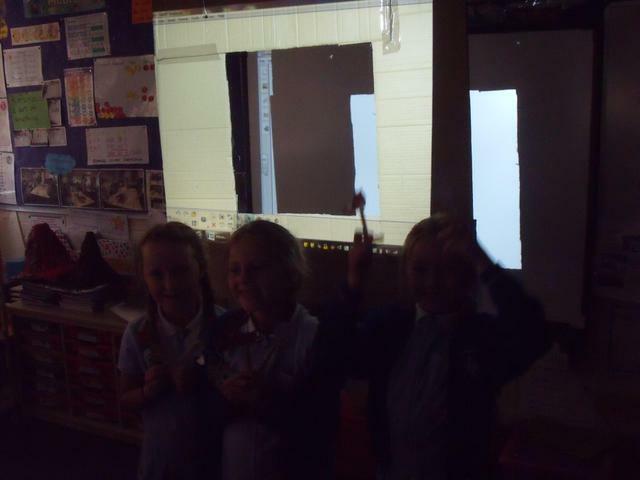 They learnt that shadows are formed when the light from the light source is blocked by a solid object.